Here is my most recent bake from Fika! This one puts me at 15 recipes completed and 15 to go. Halfway! Woohoo! Hopefully the rest won’t take me quite as long as the first half, but don’t hold your breath. 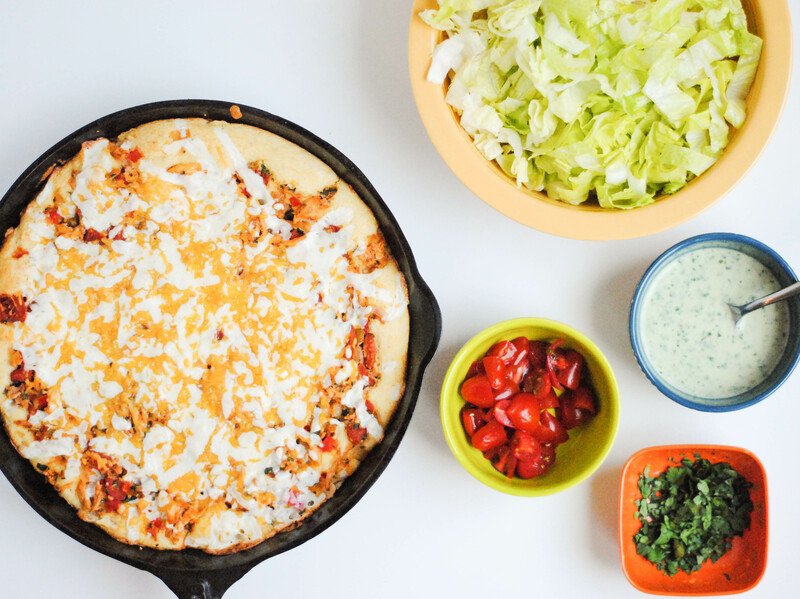 This recipe comes together so quickly and is simple and straightforward. The kids can definitely help out! The mixture of butter and oil gives these a different texture that I quite liked. The cookie bakes up slightly crumbly and delicate, but doesn’t fall apart, is still moist, and has lovely buttery flavor. I didn’t find the lemon balm to be overwhelming, which was a fear I had initially. It was just noticeable enough to add some interest to such a simple cookie. The green specks are nice, too. You could probably use other herbs, rosemary or thyme, possibly tarragon and mint as well. Let me know what you try! The recipe doesn’t call to roll these in sugar before baking, but it just felt right. And the resulting sweet and crunchy exterior is great. 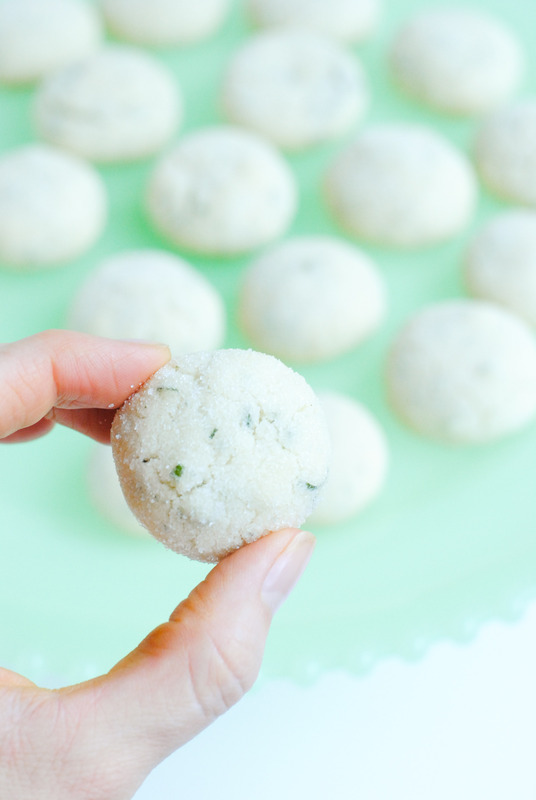 Lovely little sugar cookies with a light, airy, dreamy texture and the subtle flavor of lemon balm. 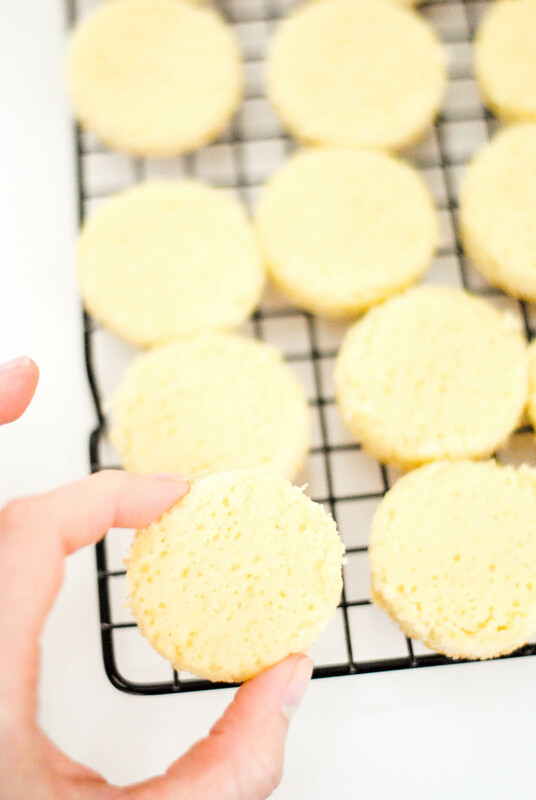 Beat butter, sugar and oil together until light and fluffy. Add in the flour, baking soda, salt and vanilla and mix well. Fold lemon balm leaves into the batter. 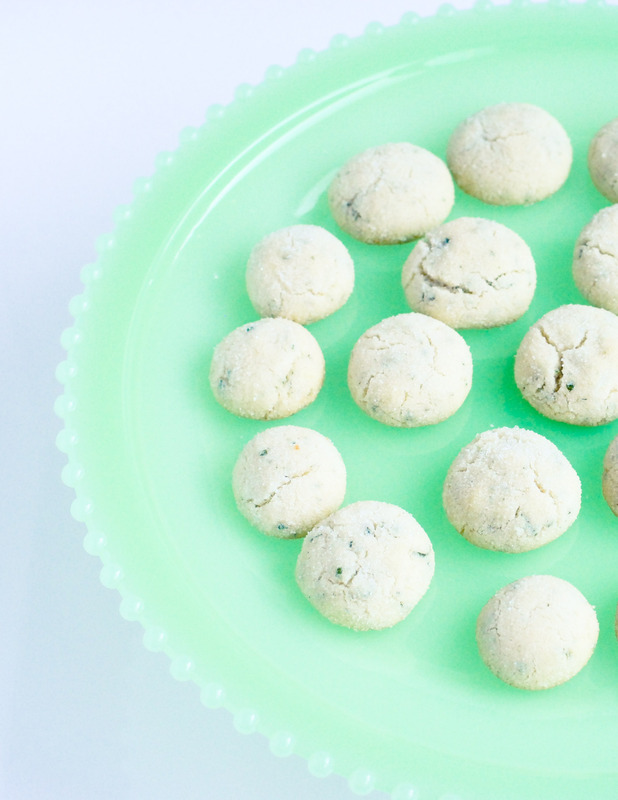 Roll dough into small balls (a rounded teaspoon is a nice size) then roll in sugar and place on baking sheet, leaving a little room between the cookies. Bake for 12-15 minutes, until just slightly golden. 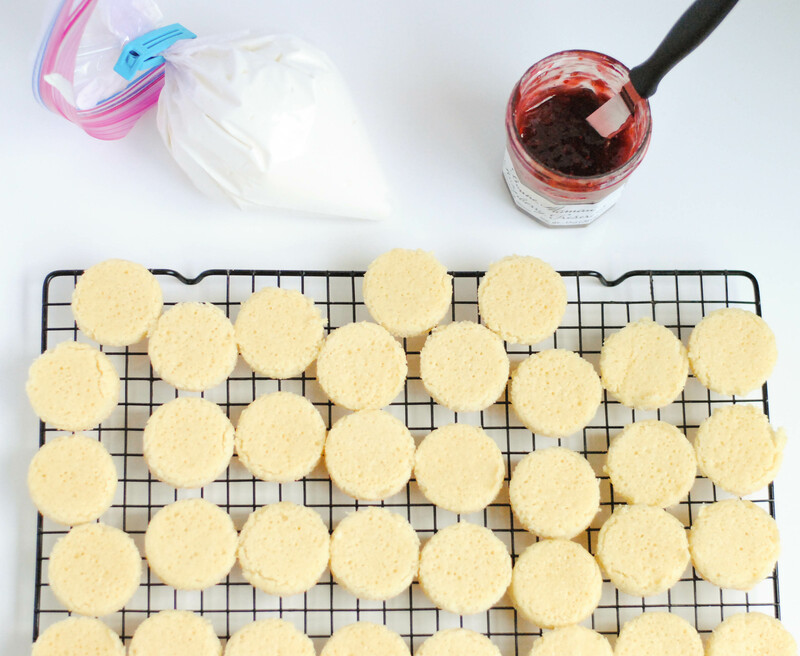 Remove from cookie sheet and allow to cool on wire racks. If you have any interest in cakes (making, eating or both) and you haven’t picked up a copy of Layered by Tessa Huff yet go order it right now! It’s a truly lovely book with great cake baking and decorating tips complete with some helpful step-by-step photos. While I’ve only tried a couple cakes so far, I love it and can’t wait to try more of her recipes. Go now and order a copy. Go. To me a birthday is not complete without a cake. Another dessert can serve as a substitute if need be, but cake! Birthdays were made for cake! I decided to make a cake for my birthday this year, and the strawberry and confetti cake from Layered was the obvious choice. I encountered some problems when I made this, and originally I was calling this cake a “fail” but it wasn’t. After all was said and I done we stuck candles in it, sweet friends sang “Happy Birthday” and we all ate it and enjoyed it. What it was was imperfect and a good learning lesson. I am so glad I tried this cake, even though it wasn’t as amazing as I thought it would be! 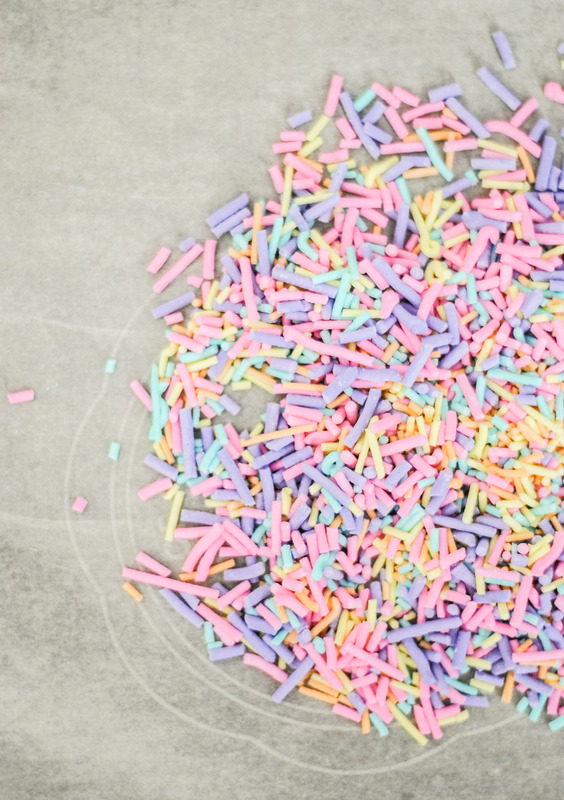 The first step for this cake was making your own sprinkles. By hand. Yes. Did you even know this was possible?! I didn’t. It was time consuming, but not hard. I would do it again for sure. 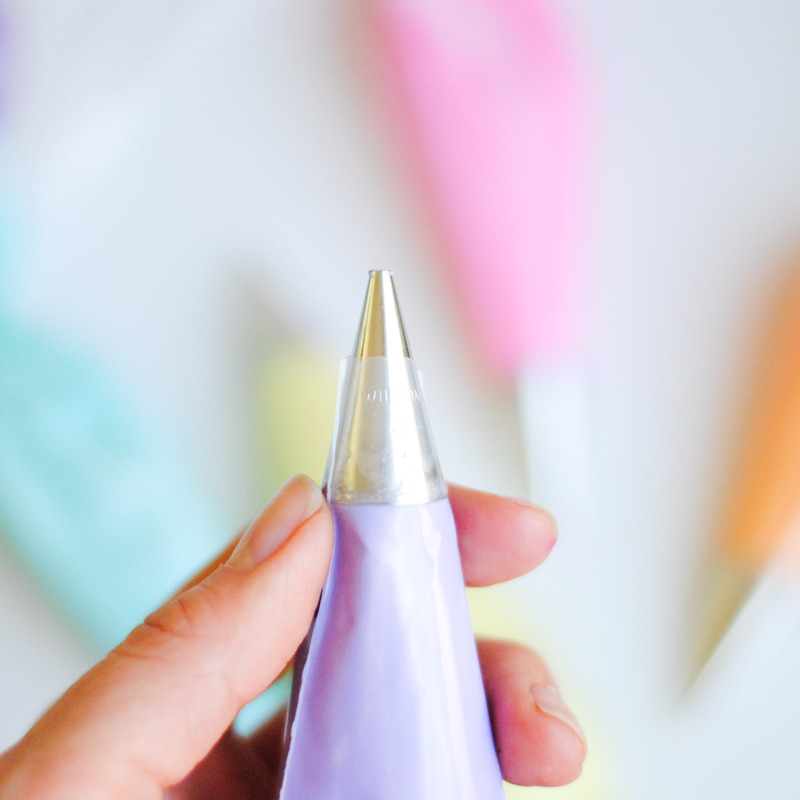 Make sure your frosting tip isn’t too small. My hand was worn out after using a Wilton #3 tip. #4 was way easier. And if you used an even bigger one that should be fine, the size of the spinkle has more to do with how much you pipe. A bigger tip means you pipe less, a smaller tip means you pipe more. I don’t know if that makes sense now, but if you’ll know what I mean if you try it. 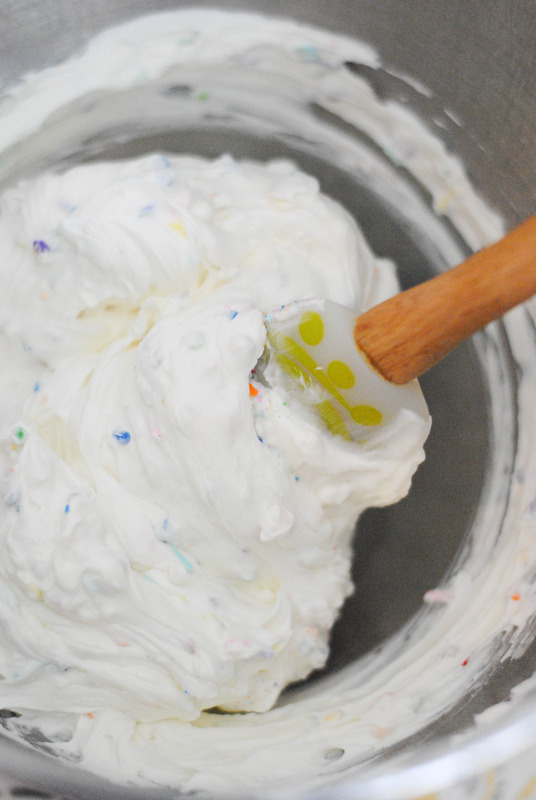 If you can stand it, use up all of the sprinkle batter! I was so tired and ran out of cookie sheets, so I stopped. When I went to make the cake I didn’t have quite enough. So, make it all, even if it means you’ll have a semi-permanent claw hand. If you want bold colors, go a bit darker than you think you should. I felt that mine dried slightly less bright than the original color. 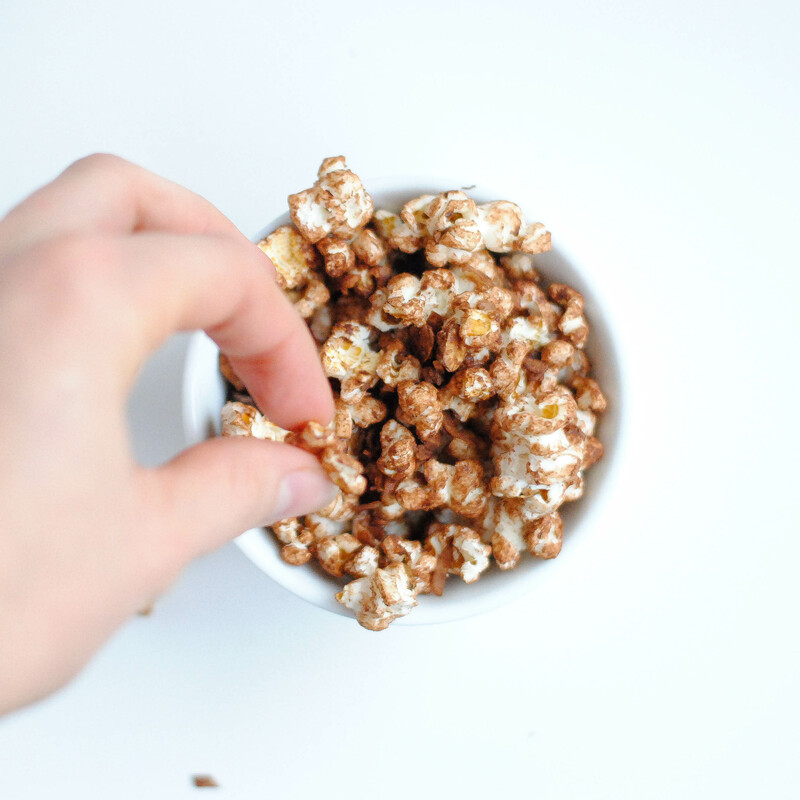 Have a small bowl of water handy to dip your finger in to press down any peaks that form on the sprinkles. There is a sweet spot for the amount of water. If you get too much water they’ll ooze and take a much longer time to dry. Too little and they’ll stick to your finger. You’ll learn pretty quickly what works best. If you get tired of piping dots, pipe long strips, let them dry, and break them up to make jimmies! I like the look of both the circles and jimmies together, anyway. Fit a stand mixer with the whisk attachment and pour the egg whites in to the bowl. Mix on medium low until foamy. Gradually add the powdered sugar and gradually increase the speed until you’ve added all the sugar and the speed it at medium high. Whisk until the mixture has smooth, stiff and glossy peaks. Add in the vanilla and beat just to incorporate. 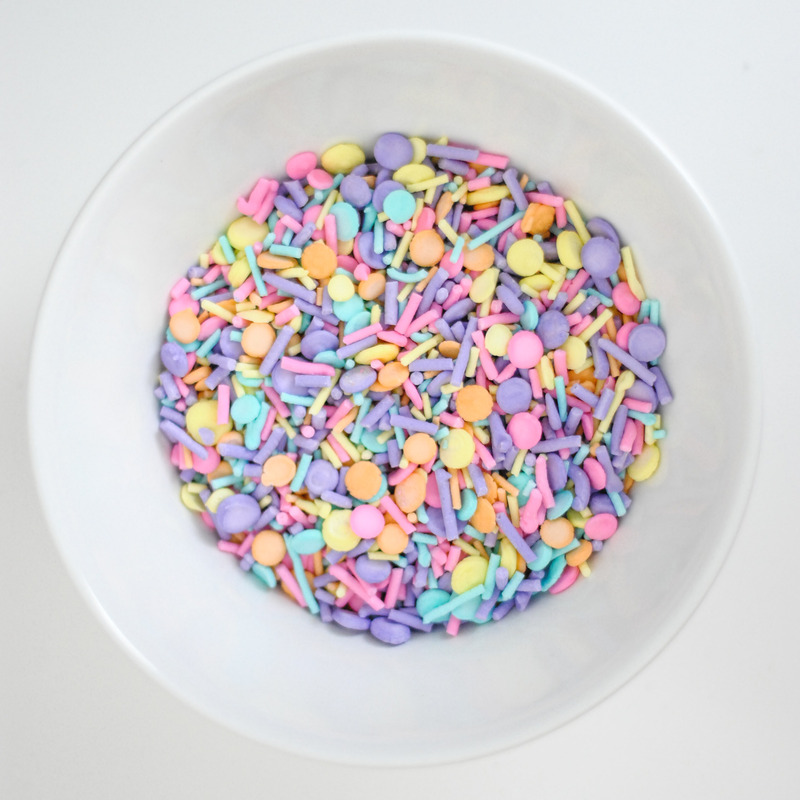 Divide the sprinkle batter in to as many bowls as colors you plan to make. 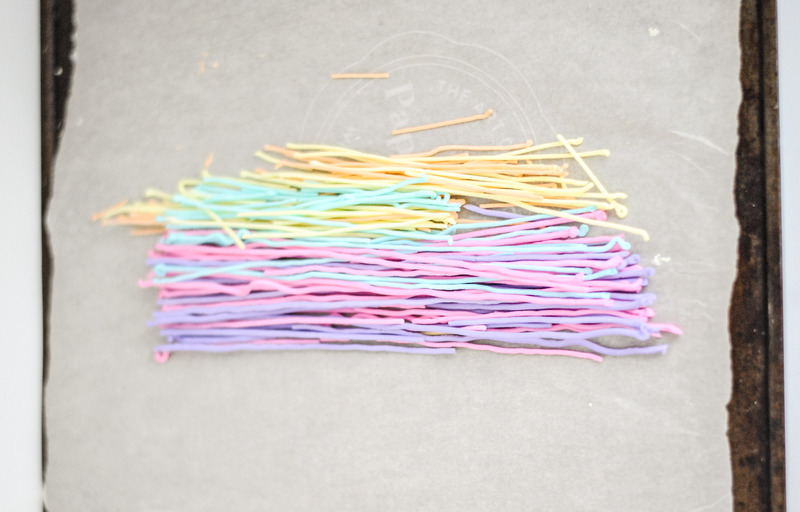 Color with gel color, being sure to mix completely (a small spatula is good for this). 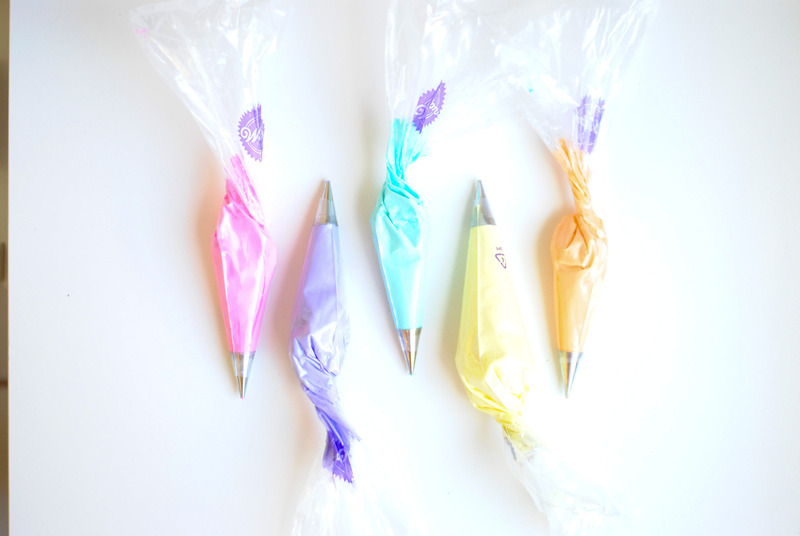 Place each color of icing into a piping bag fitted with a round tip. 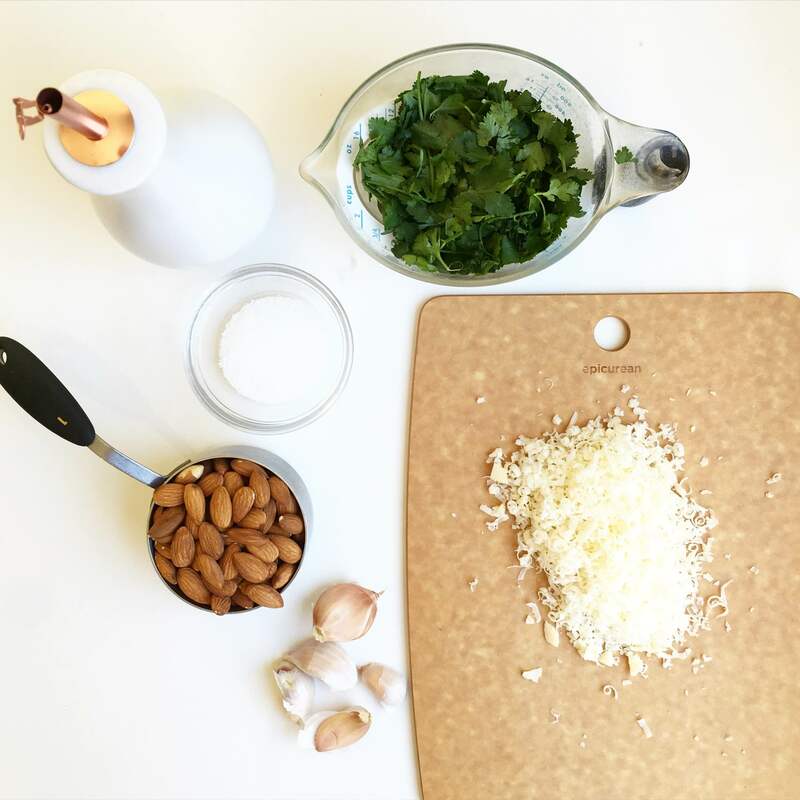 Line cookie sheets or your counter top (as long as no one in your household likes to climb on to the counter or pull stuff off the counter) with parchment paper or non-stick silicon mats. Pipe small circles onto the paper and use a damp fingertip to flatten down any pointy peaks that form. Let dry for AT LEAST 2 hours (the longer the better) before using. I made everything the day before, 2 kinds of cake, strawberry puree, strawberry cream filling and an Italian meringue buttercream. Once my kids were in bed for naps on the following day, I set up my tripod in the light filled corner of my kitchen and got to work. I tinkered with the settings on my camera and had everything ready to hopefully create a lovely step-by-step assembly animated GIF. Everyone would be so impressed. Ugh. Overconfidence can kill, guys. 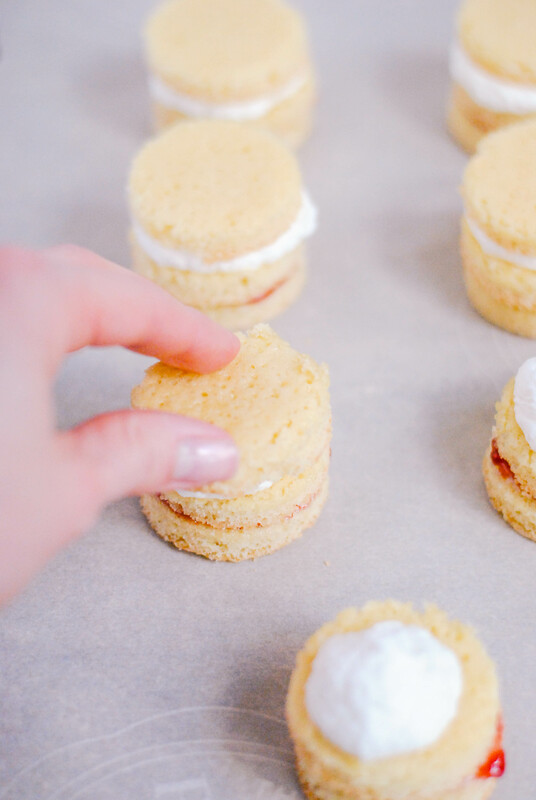 As I started layering the cakes with the strawberry cream I realized my dreams of perfection were dashed. The cream was oozing out the sides and on to the cake plate and the cake was beginning to tip over. 5 layers! Of course it was falling over! I am not a cake decorator. I did not think through this whole process as well as I should have. I also didn’t think to have my AC running to counteract the July heat and humidity we have here in Houston. Taking pictures in the light filled corner didn’t help, either. The cake was melting. I had a, “Well, now what? !” moment, probably cursed a little bit, and then grabbed some skewers from a drawer in the kitchen and tried to straighten everything out. From there I stuck it in the fridge and hoped for the best. Please notice the second to the last image in this GIF. I’ve already said this, but it reminds me of the cake in Sleeping Beauty. Just about ready to topple over and be supported by a broomstick. I’d already whipped up the frosting and folded in the sprinkles (bad call), so I had to put that all back in the fridge. I was not at all sure what back and forth from the fridge would do to an Italian meringue buttercream…but I didn’t really have another option. Here it was it all of it’s glory, nice and white with pops of sprinkles. This is when it should have gone on to the cake but instead was sent back to the fridge. Now the buttercream. I let it sit for a while, then whipped it up again, no doubt damaging many of those sprinkles and creating a nice grey hue to the icing that should’ve been white. The texture was also off. Awesome. I had an ok time getting the cake iced, even with the uneven layers. Thankfully I’d saved some icing without sprinkles for decorating the edges, and some of those precious sprinkles for the final touch. Now, what really matters is how it tasted. And it was delicious! 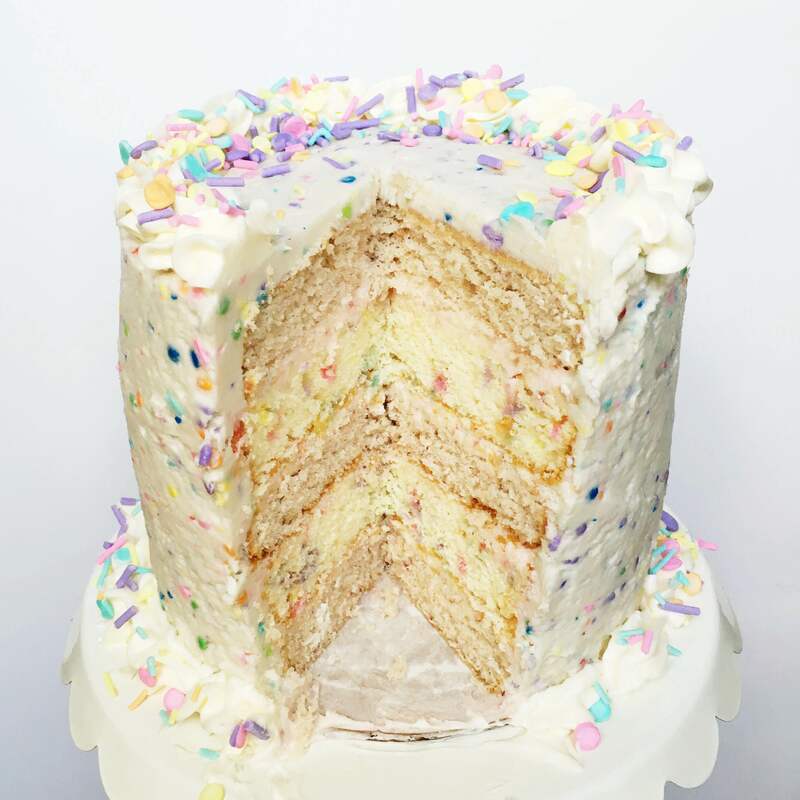 Especially the confetti layers. 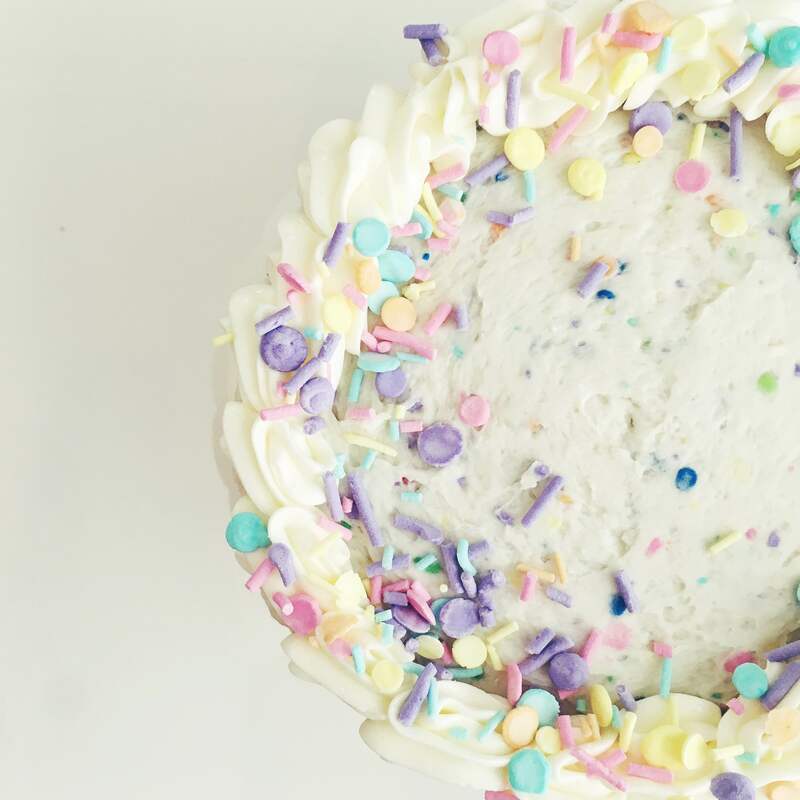 My daughter turns 4 next month and I am seriously considering the confetti cake recipe for either a cake or cupcakes. When I went to visit my sister last fall I bought a magazine at the airport that she later made fun of me for buying, a Cast Iron Cooking magazine! Of course she had reason to poke fun. I should’ve bought some beauty, design or gossip mag like normal women do. But this magazine has already produced two very tasty meals, so I don’t mind so much. They call this a “twist on taco salad” which is a great description and makes this a meal that doesn’t really require a side dish since it’s the main dish and the veggie side. You don’t need to do too much prep, just some chopping of vegetables. And everything is done in one skillet. You can shred the cheese, or buy pre-shredded. The recipe calls for shredded rotisserie chicken, but if you have leftover cooked chicken that would be perfect, or you could poach chicken breasts if you have the time. A can of tomatoes and green chile is on the ingredients list, but if you want to skip the green chile or can’t find it a partially drained can of diced tomatoes will do just fine. 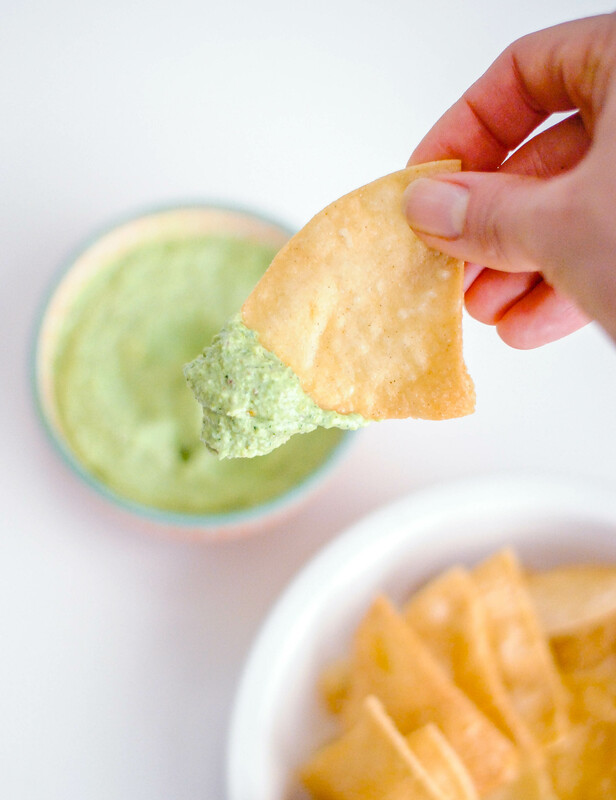 The dressing is something quite close to Chuy’s creamy jalapeno so be sure to save whatever it left over and use it as a dip for tortilla chips! 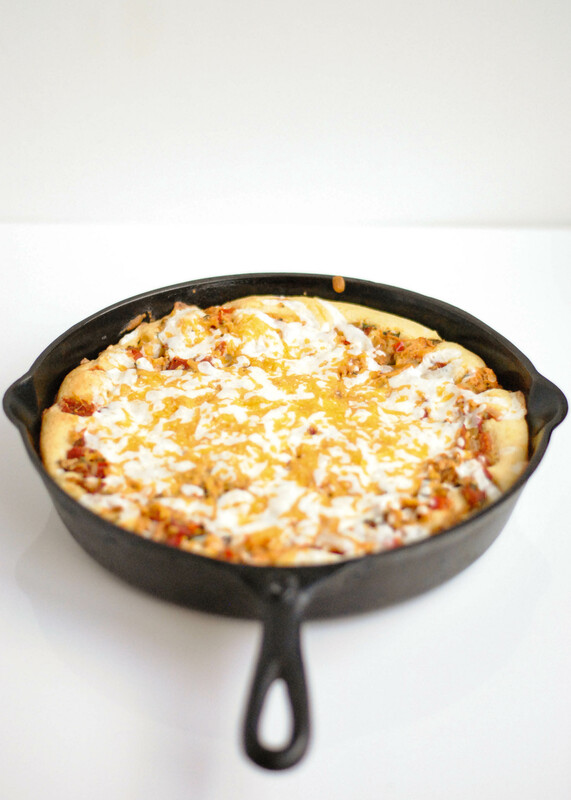 The recipe uses a blend of mozzarella and cheddar. Any cheese you’d use for tacos or fajitas would work, monterery jack, colby, cheddar, or the Mexican cheese blend they sell in bags. The cornbread base has tortilla chips baked in. I had some very thin tortilla chips that weren’t the best in this situation, they lost their crunch. A nice thick corn chip would be better here and hold up nicely. I’ll definitely be sure to do that next time. And there will be a next time because there is so much room for modification here. Adding in black beans or corn, using ground beef instead of chicken, or leftover fajita meat which we often have after cooking up fajitas for friends…we always overbuy! 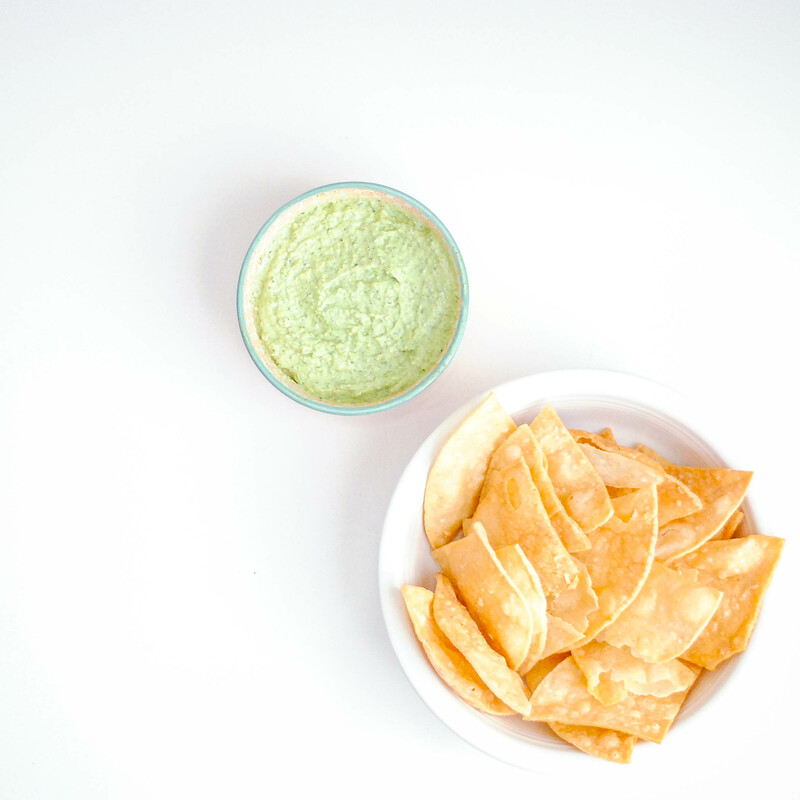 Combine cilantro, ranch dressing and salsa in a food processor and mix until well blended. Cover and chill until ready to use. Heat oil over medium heat in a 10-inch cast iron skillet. Cook onion, bell pepper and jalapeno until softened. Stor in chicken, tomatoes, cilantro and seasonings. Cook for about 5 minutes, taste and season more if needed. Transfer filling to a bowl, wipe out skillet and grease with crisco. In a bowl beat egg, milk and cornbread mix just until combined. Put chips in the greased skillet, then pour batter over the chips. 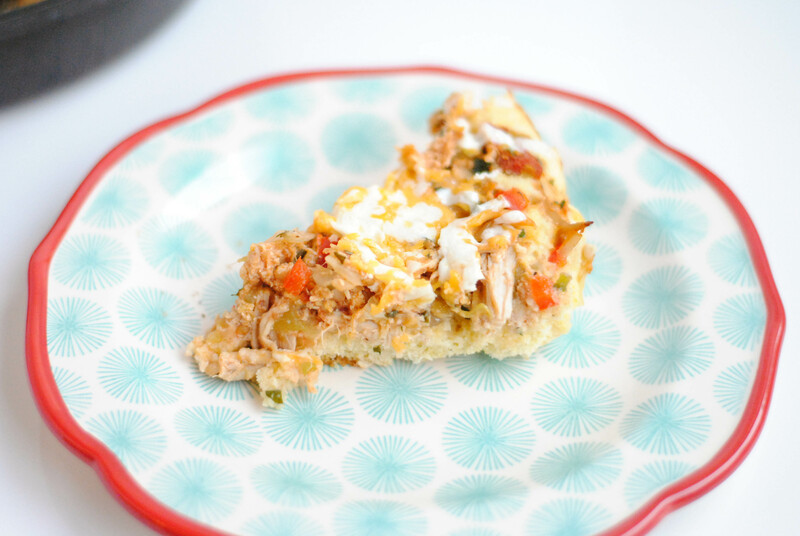 Spoon chicken mixture over the cornbread batter and sprinkle with cheeses. Bake for 15-20 minutes, let cool briefly before cutting in to slices. 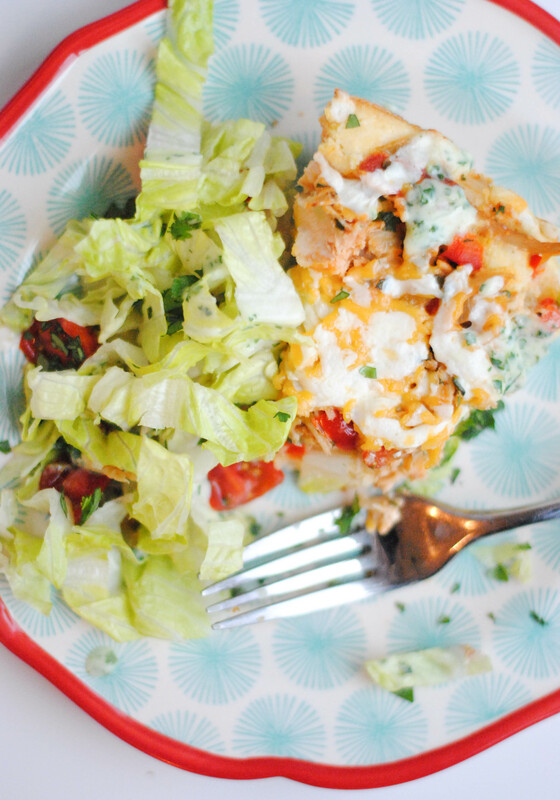 Top slices of cornbread with shredded lettuce, tomatoes and cilantro. Sometimes I am a good meal planner. I look through the fridge, freezer and pantry to see what we have, what needs to be used, etc. and plan our week of meals out that way. Other times I find myself on Tuesday mornings after I drop the kids at school (this is when I like to grocery shop since I only have one child to accompany me) with no idea what we have in the fridge and pantry which leaves me searching for recipes on pinterest and making a grocery list while in the parking lot of HEB. Thanks to my inabilty to plan, I sometimes come home and discover we already had 8 cans of tomatoes, or goat cheese, or couscous, or a dozen chicken breasts I could’ve thawed out, etc. Herbs are tricky. Often all you need is a few tablespoons for a recipe. Thankfully I’ve managed to keep rosemary and thyme alive in the back yard, but parsley and cilantro are another story and so I have to buy them. They’re not expensive, but when you don’t need much they often get forgotten in the bottom of the produce drawer. I bought cilantro for a recipe because I thought rather confidently “I know that I have parsley at home, but no cilantro.” Not the case! I had two almost completely full bundles of cilantro at home already, so when I unloaded groceries I now had three bundles. At this point I had no plan for the pesto I’d just made, but I knew that I could save it. Freezing pesto in tablespoons to have on hand for later is a trick I am so glad I learned. Having something on hand in the kitchen is nice, but having pesto on hand is especially nice because you can incorporate some fresh herby-ness to a meal even when you don’t have fresh herbs or if they’re out of season. 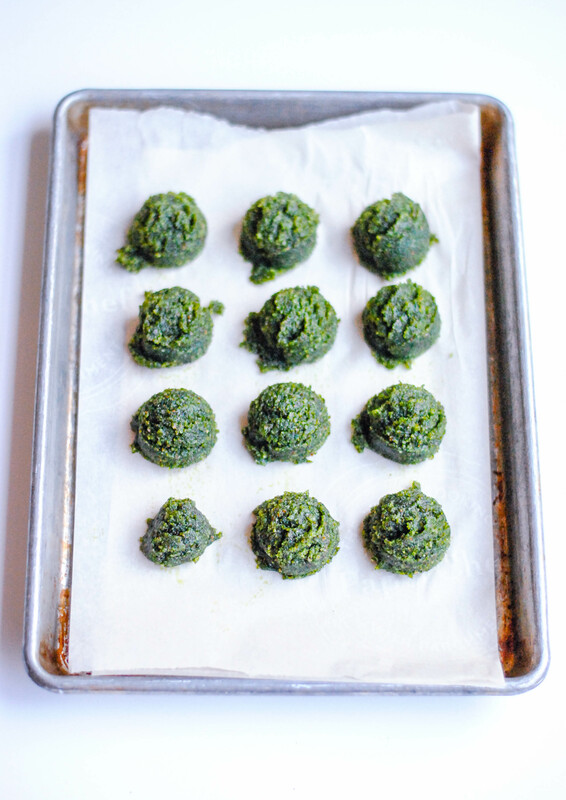 The best way I’ve found to freeze pesto (this also works well for tomato paste) is to line a baking sheet with parchment, use a cookie scoop or tablespoon to divide up the pesto, and then pop the pan in the freezer. Once frozen solid you can put all the pesto balls into a freezer bag (I learned that labeling your bag is very helpful!) and take one or more out as you need them. They thaw out pretty quickly. Of course I wanted to try some of the pesto right away. I ate some on a chip and it was good, but strong (like most pesto) and needed to be cut if I was going to eat it as a dip. 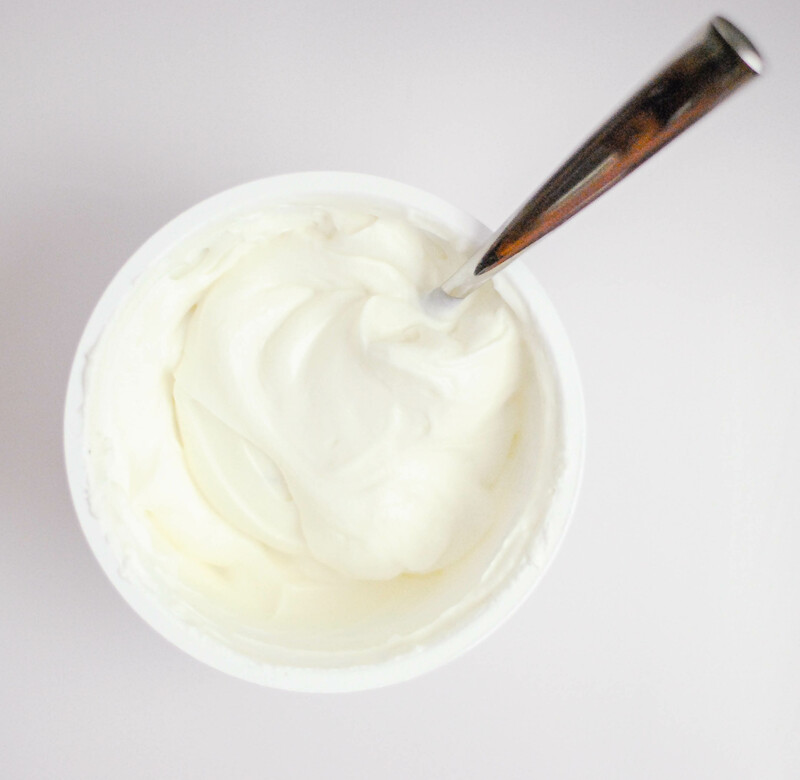 Plain Greek yogurt seemed like the perfect choice. I played around a little with the ratio but found a 2:1 yogurt to pesto was pretty good. Of course you could start there and add more yogurt or more pesto depending on your tastes. The same thing could be done with mayo to make a nice sandwich spread. You could also spread the pesto on chicken breasts before baking, stir in to hot pasta, use as a dipping sauce for grilled meats or serve with grilled vegetables. Excited to try some of those out as summer and grilling season get underway! 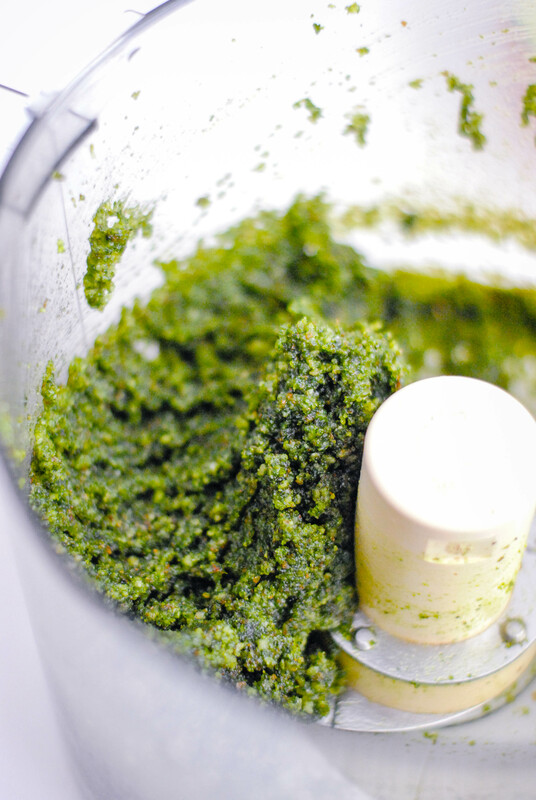 Combine cilantro, almonds and garlic in a food processor and puree until smooth. Scrape down the sides of the bowl. Add the Parmesan and salt and pulse a few times to combine. With processor running, drizzle in the oil and process until smooth. How much of the ingredients you need depends on your taste and how much dip you want to make. Below are the amounts I used to make dip for 2-4 people as an appetizer serving. Increase or decrease as desired. Combine both in a bowl and mix well to combine. Serve immediately or chill until 5-10 minutes before serving, it gets thick when chilled so let it warm up at room temperature for a bit before serving. So far in Baking through Fika I’ve not done anything beyond the stated recipe. But every other recipe has been pretty straightforward without much room for creative license. 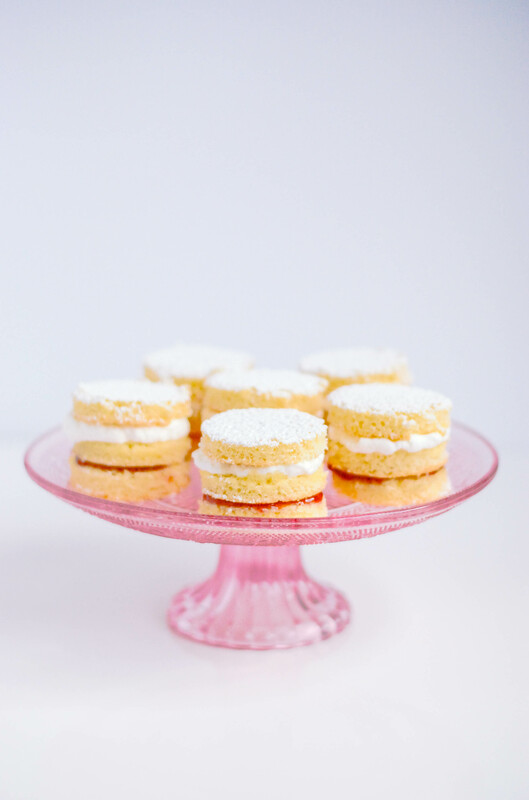 This is a simple sponge cake with lots of ways to play! 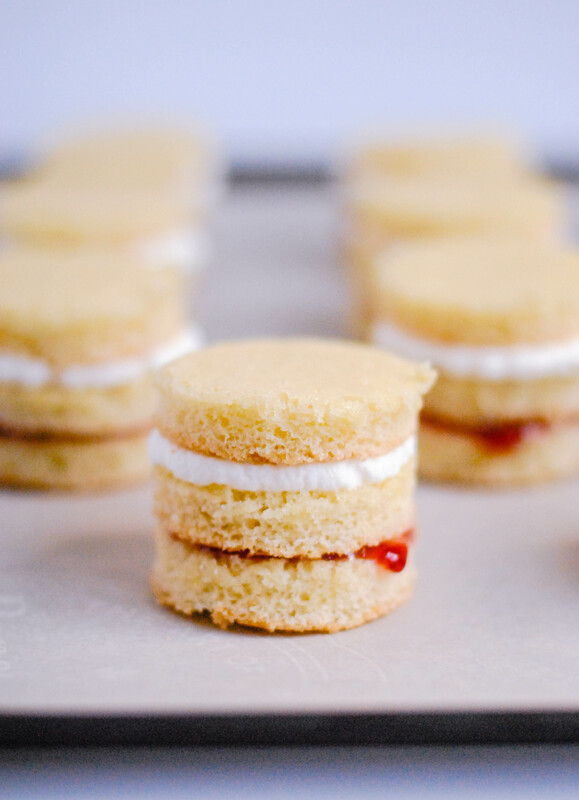 So I decided to do a Victoria sandwich type cake, but in mini form. I blame by recent binge of The Great British Baking Show during which I cried more than once. It’s so wonderful. Go watch it now. There is little doubt in my mind that my sponge cake was imperfect. I don’t know what perfect sponge cake should be like, but having made it only twice I am certain that I do not have the skills to make it perfectly. Should it have all those bubbles? Should it have risen more? Should I have baked it longer? Or less?! How’s the flavor? I would love (and at the same time hate) to have Mary and Paul in my kitchen telling me what I’ve done wrong and how to fix it. But this cake certainly tasted delicious, and for me that’s what matters most. With sweet quick breads like banana and zucchini I like to grease and sugar my pans instead of greasing and flouring them. I like the bit of sweet crunch from the sugar. I decided I’d try that with my jelly roll pan for the sponge cake and it worked very well. 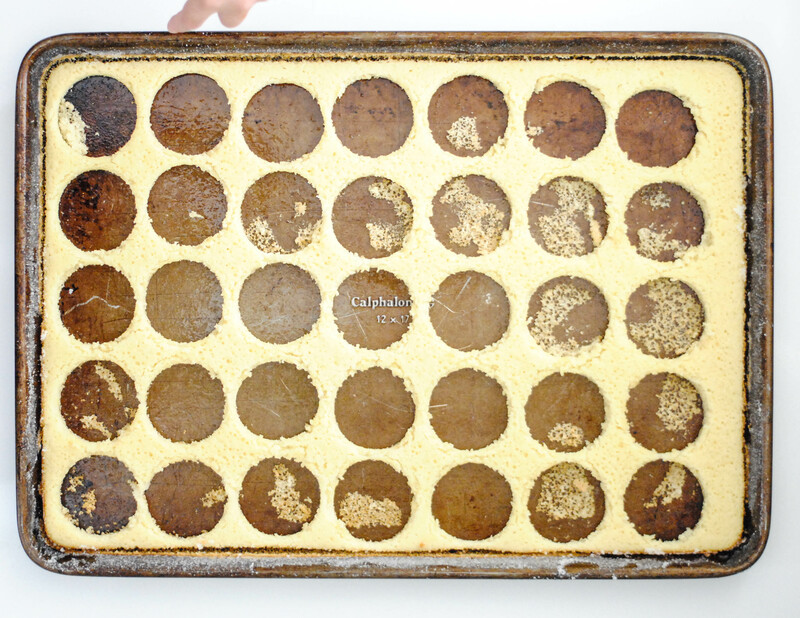 The cake rounds were easy to cut and remove from the pan with only a few bits that stuck. But would Paul and Mary approve?!? This one pan of sponge gave me 35 1 1/2 inch diameter rounds. If you don’t have a set of biscuit cutters, go get some. They have many uses beyond biscuits! 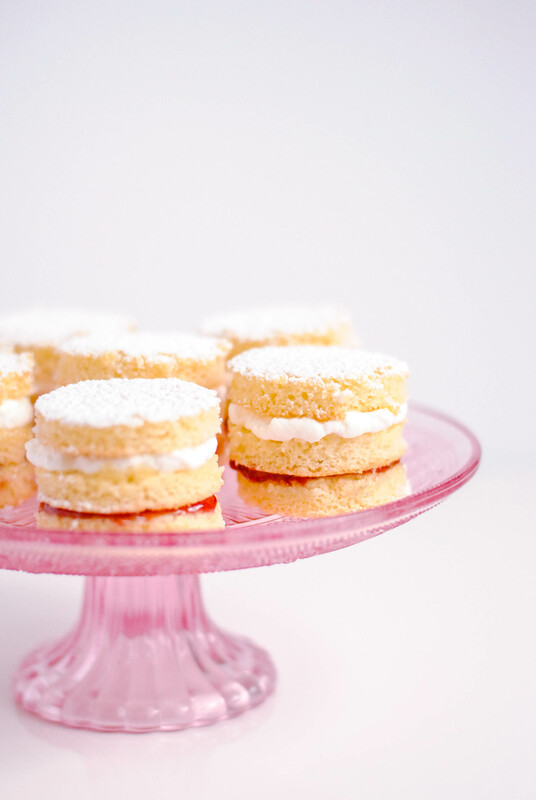 So what is a Victoria Sandwich? 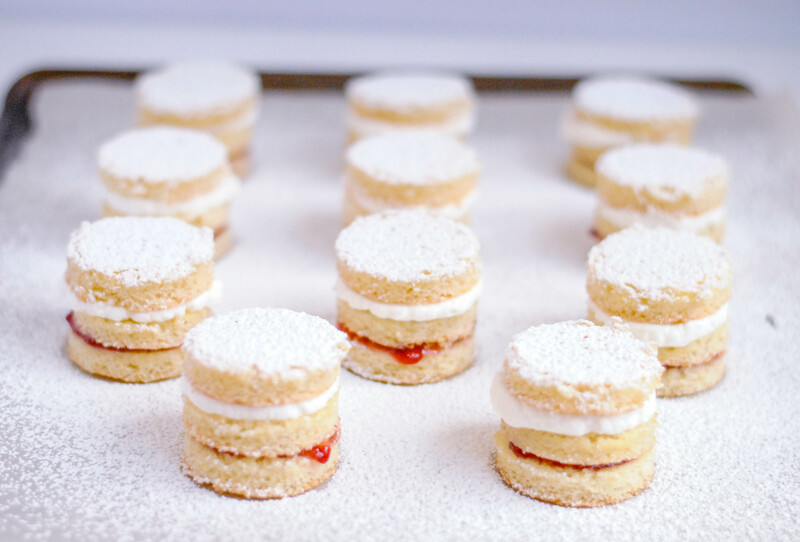 It is simply two layers of sponge cake with raspberry jam in the middle dusted with powdered sugar. It became popular in England during the reign of Queen Victoria, and I’ve read that it was her favorite tea time treat. But I’ve also read that that is not in fact true. So who knows. Not sure when cream cake in to the mix, but I am happy it did. Since my sponge cake wasn’t very tall I made three layers instead of the two that I’ve seen in a Victoria sandwich. 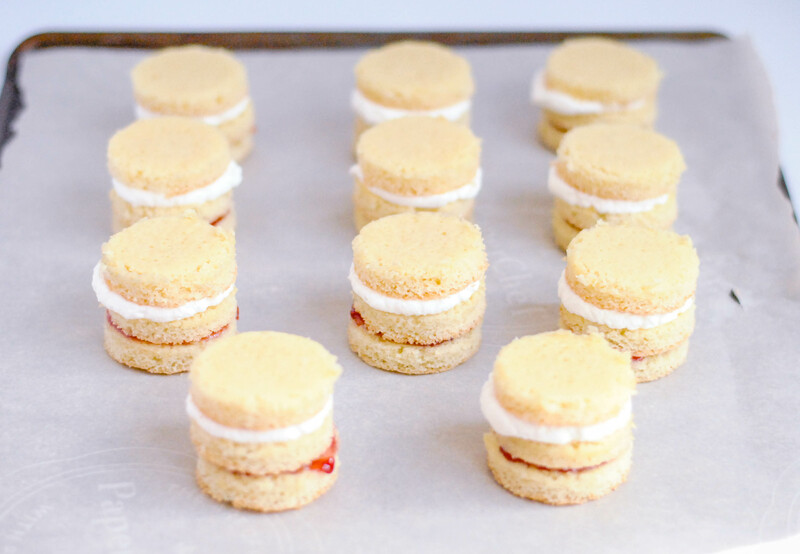 I like the way they look with the three layers, but if you want to stretch the number of these you can make from one batch of cake, then two layers would be perfectly fine. I used raspberry jam, but any kind would work. I also played it safe with the amount of jam, just a thin layer. It could’ve used a bit more, but I would rather them have too little jam than to have it oozing down the sides. After the layer of jam another cake layer is added and sweetened whipped cream is piped on. I add a little powdered sugar, a little almond and a little vanilla extract to mine just because that’s how my mom does it. But go unsweetened, or without either of the extracts of you’d like. 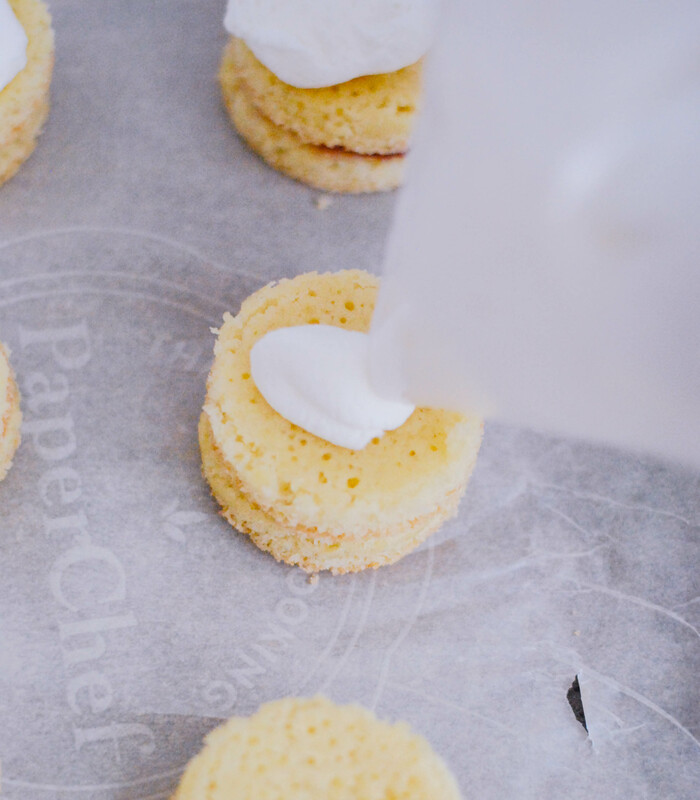 Atop the cream goes one last sponge layer. Pardon all the pics! 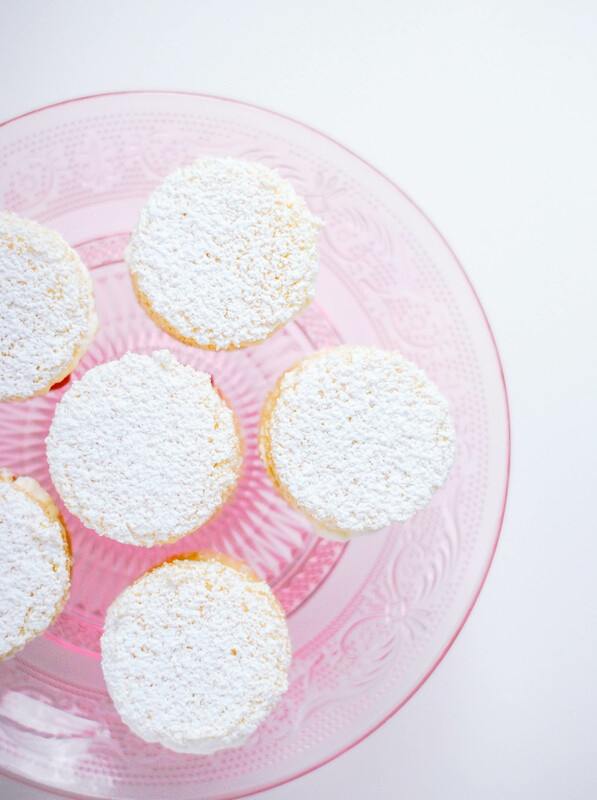 I kind of loved taking pictures of these photogenic little bits of sweetness. 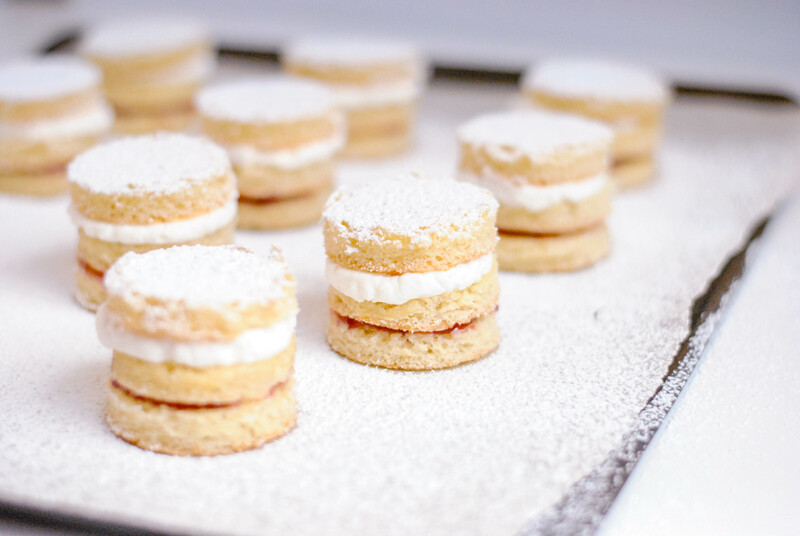 Now dust generously with powdered sugar and serve to your lucky guests! 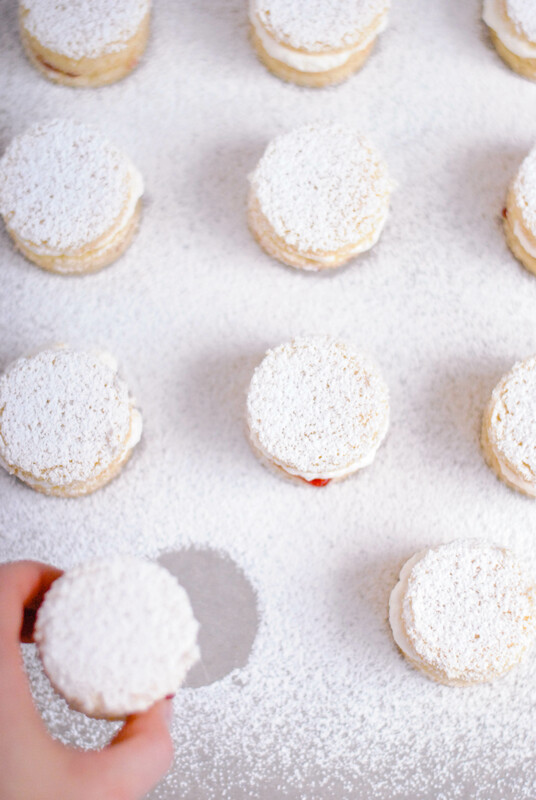 If you plan to refrigerate these don’t do the powdered sugar. Save that for right before serving. It will soak into the cake and make it kind of gooey. Still delicious, just not as lovely. I’m kind of hoping my daughter will want a tea party for her 4th birthday because I can see these being a terrific addition to the spread. Grease and sugar a jelly roll pan (rimmed baking sheet) and preheat oven to 350°F. In a separate bowl whisk flour, baking powder and salt. Combine milk, melted butter and extracts in a small bowl. Add flour mixture to the egg and sugar mixture, stirring just to combine. Add the milk mixture and fold together into an even batter. Spread into pan and bake for 10-15 minutes. It will be light in color and when pressed lightly in the center should spring back. 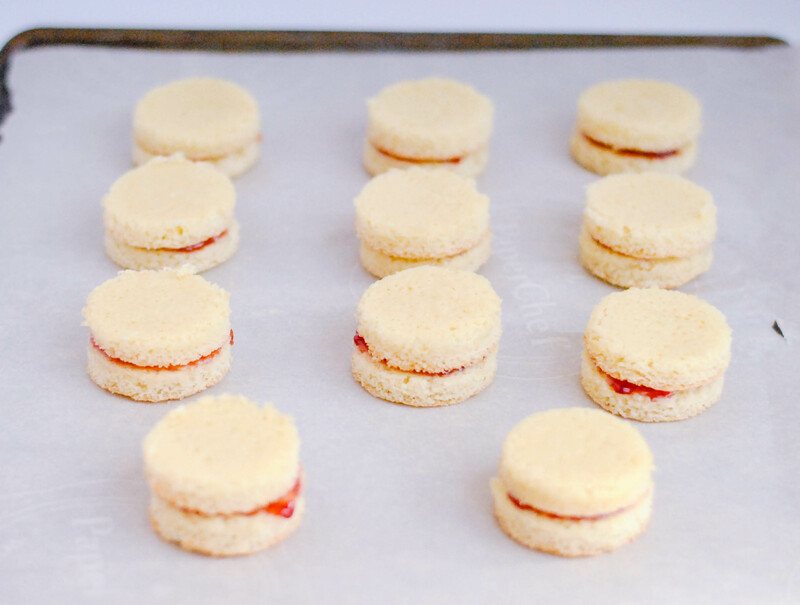 Let cool slightly before cutting in to rounds, then let rounds cool completely before moving on. 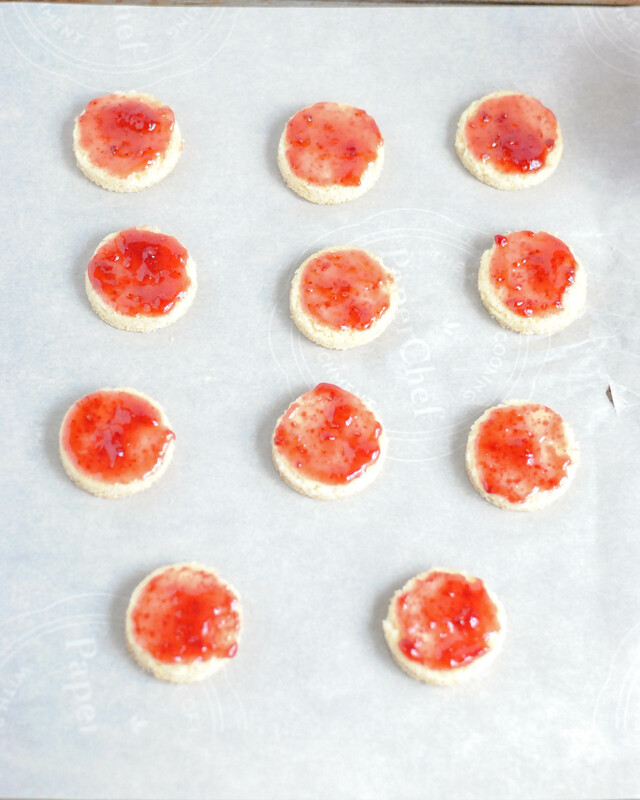 Arrange 1/3 of the rounds on a cookies sheet. 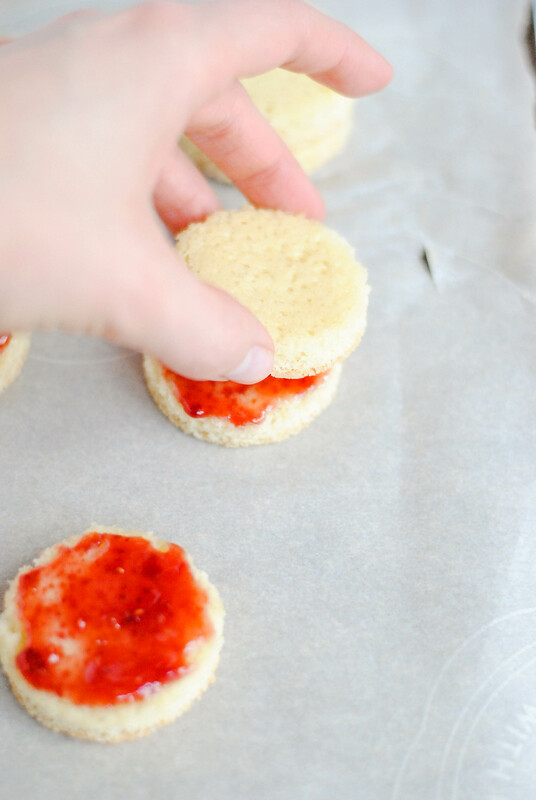 Spread each with a thin layer of jam. Pipe on a nice bit of sweetened cream. When things don’t turn out as neat and tidy as they were intended to be you can get away with it by calling your product “rustic”. Which is most of the time just a nice euphemism for “messy”. These cookies aren’t messy, but they do have “rustic” in the recipe title, which means there need be no anxiety about how neat they turn out, because they’re not supposed to be perfect! My kind of recipe. As you can see, my cookies are not the same size. Precision is not the goal remember, they’re rustic. So don’t worry about rolling the log into a perfect cylinder, just roughly the same thickness so that the baking time can be the same. If you want to make them perfect, though, then go for it. 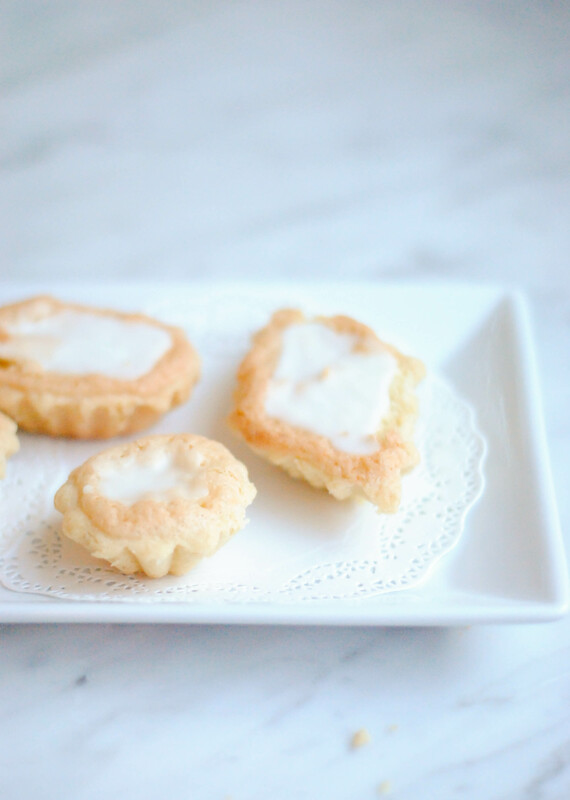 These are like sweet almond butter crackers, crisp and with a nice petite size that makes for a treat that satisfies your sweet tooth without making you feel guilty. As with many recipe in this cookbook they’re perfect with a cup of coffee. I stashed what we didn’t eat in the first few days in the freezer. I simply take a couple out in the afternoon, let them thaw a bit (or not) and enjoy them during the few minutes of calm I get at nap time with my reheated coffee from the morning. Such is my glamorous life, guys. 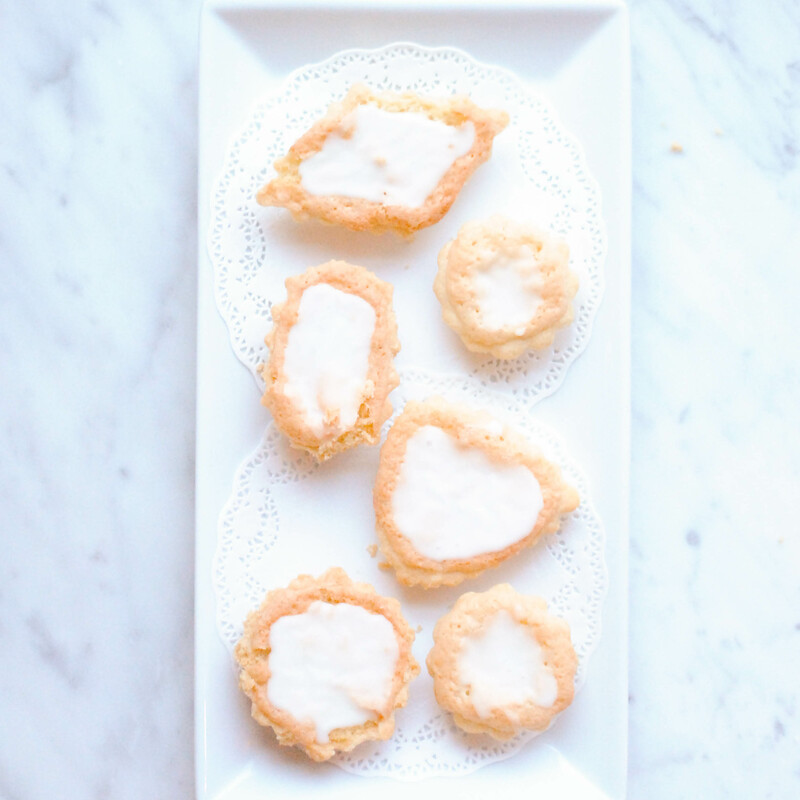 This is one of those recipes in FIKA that only has a few ingredients (all of which I almost always have) and has very little hands-on time, making it perfect for a quick treat that can be completed quickly. Start to finish these take under 2 hours including the hour of chilling time. Another benefit to a short ingredient list is the simplicity of this cookie, which may be another reason it’s called rustic. 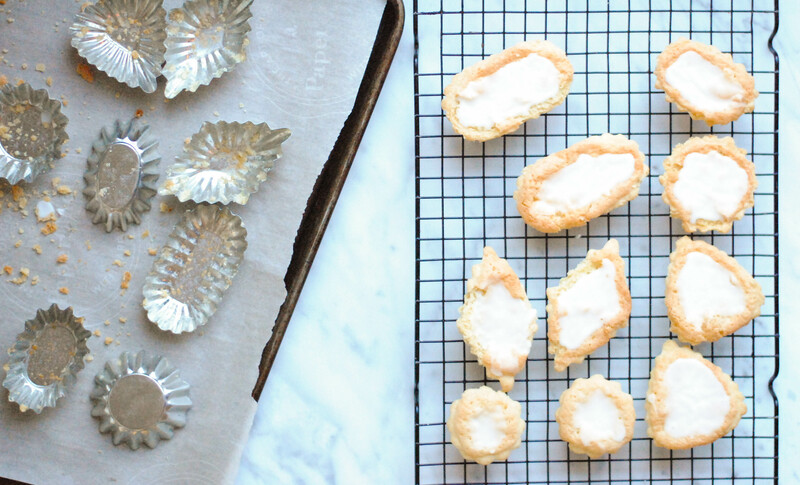 Simple ingredients and a simple baking method. I sometimes feel like if I don’t make something extravagant that’s loaded with a million special and indulgent ingredients that no one is going to care. But I think there is something refreshing in simplicity in the kitchen, especially in a world where people are making hamburgers with donut buns. I’m not knocking them, though. I’m from Round Rock originally, and the next time I get a chance I will probably try this hamburger if it’s still on the menu. I’ll eat the crazy food, I’m just not going to make it. Beat together butter, sugar and corn syrup until thoroughly combined. Whisk together flour, almonds, salt and baking soda in a small bowl. Add flour mixture to the butter mixture and beat to combine. On a floured surface, roll the dough into a log about 1 inch thick. Wrap in plastic and chill for at least 1 hour. 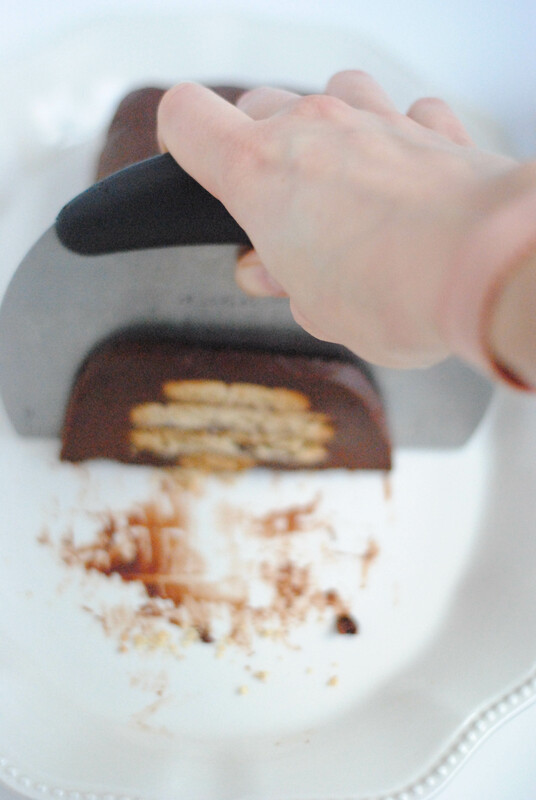 Using a serrated knife, slice cookie log into slices between 1/4 and 1/2 inch thick. Place on prepared cookie sheet, spacing them 1/2 inch apart. 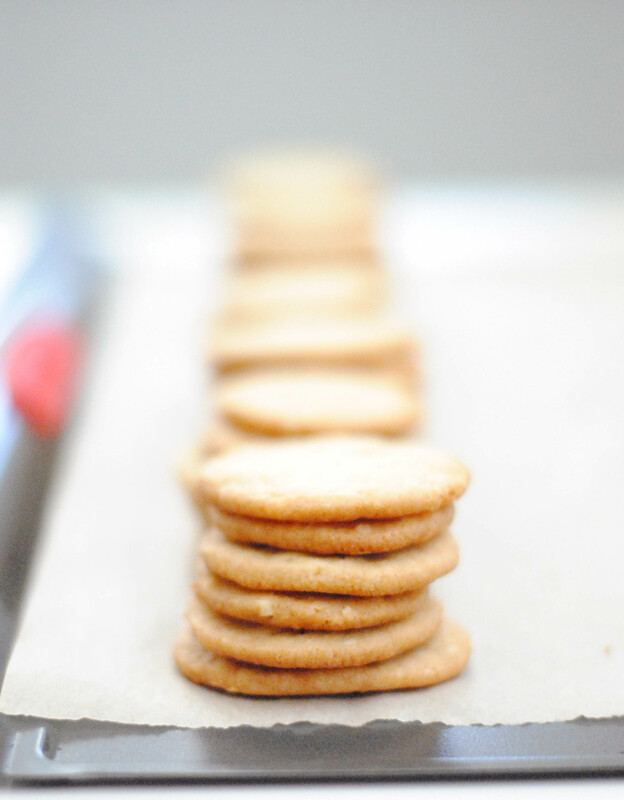 Bake for 5-8 minutes depending on how thick you sliced the cookies. They should be just golden on the edges. Let cook on a wire rack. Before I get in to the food, I have to ask for some help, advice, wisdom and possibly someone to commiserate with on this. I made these enchiladas something like 6 weeks ago. But I am just now blogging about them. Why is cranking out a simple post so difficult? I have the hardest time finding the time, or maybe it’s making the time, to blog. I have three kids (ages 5,3 and 1) who I stay home with and I think that’s a pretty good excuse, but there are people out there blogging up a storm with young kids at home. On the days I do write up a post it takes me forever if I do it while the kids are awake, and if I do it while they’re asleep I don’t get the regular housekeeping stuff done. Do any of you have any tips for amateur stay-at-home mom blogging with kids? Do you just get up early? Stay up late? Help a girl out. I cannot figure out how to balance being a mom and blogger. Now on to the important stuff! Every now and then we enjoy a proper, satisfying breakfast at our house. It’s almost always on a Saturday since that is the only day of the week we’re all home for breakfast together and don’t have to rush to get anywhere. Someday I’d like to be that great mom, getting up earlier than everyone and having a lovely table full of pancakes and eggs and bacon and hot coffee ready for the family. But I just do not know if that will ever happen! 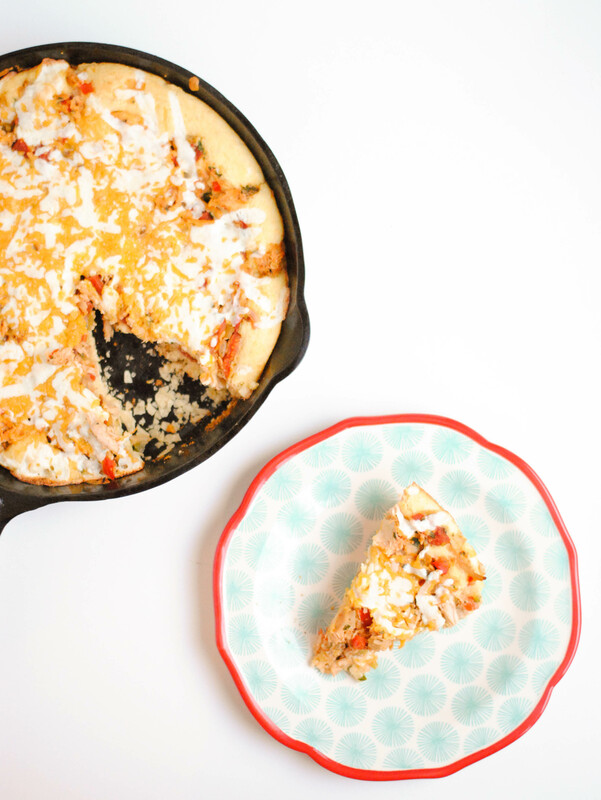 Thankfully this breakfast casserole is assembled the night before, so as long as I can get up early enough to preheat the oven and put the pan in and bake them for 40 minutes we can enjoy a hot breakfast together without the stress. This recipe is from Fine Cooking and, like most of their recipes, does not disappoint. There is quite a bit of prep and you will dirty a few pans in the process of getting these fridge ready. 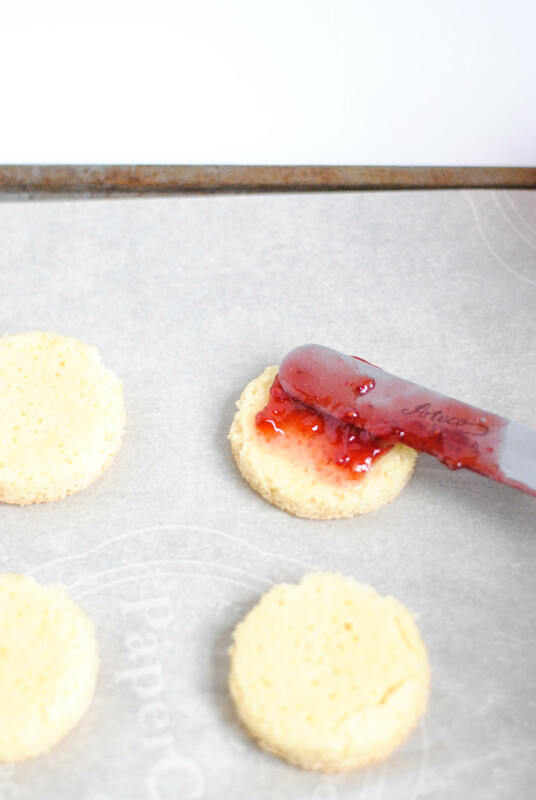 I’d recommend making these when you have some guests in town (preferably ones who like to help in the kitchen!) and getting some help with the chopping and what-not the night before. Cooking is almost always more fun when you have people to help you and keep you company in the kitchen. 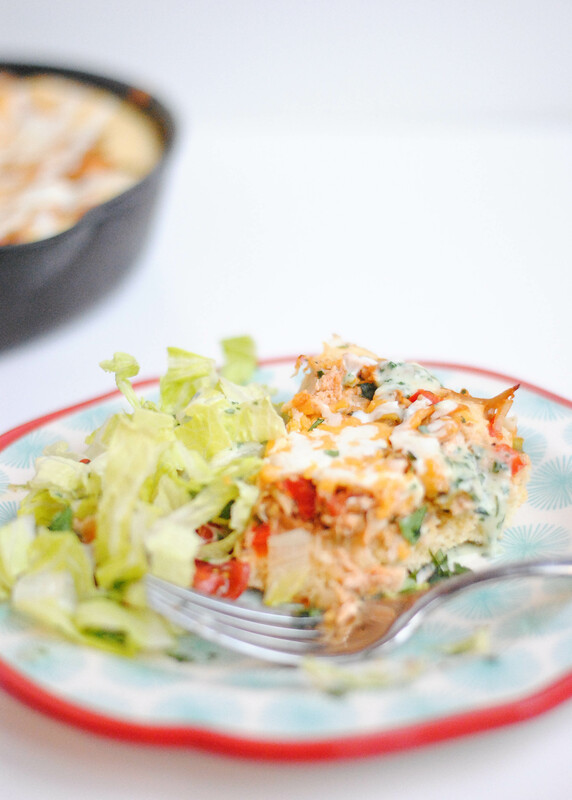 This is an easily adapted recipe if you want or need to leave something out like the onion, bell pepper, potato or even the chorizo (but only leave that out if you absolutely have to cause it’s yummy). Just be sure to replace it with something else, like black beans, more eggs, vegetarian chorizo, etc. I thought the proportions in the recipe were good and especially loved the sauce, which is very easy and well worth making. You could use it as a sauce for chicken enchiladas or just on tacos, too. I divided these in to 2 pans and baked one the first morning and saved the other to bake a couple days later so that they would be freshly baked. Of course if you’re serving a crowd I’d recommend baking them all in one big pan, but if you’re serving a small group dividing them up is a good option. I didn’t try freezing them, but it might work to do that. Let me know if you try it. Put the tomatillos and the jalapeño in a medium sized saucepan and add water to cover. Bring to a boil, then lower the heat and simmer, uncovered, turning the tomatillos occasionally, until they’re brownish-green all over and very tender, about 15 minutes. Drain and place the tomatillos in a bowl, cut the jalapeno in half and add half of it to the bowl. Use a hand blender to blend together. You could also do this in a blander. Add the cilantro, garlic, cumin, and 2 teaspoons of salt and purée. Taste and blend in the other jalapeno half for spicier sauce. Add the cream and pulse to blend. Transfer to a bowl and let cool to room temperature. Cook the potato: Boil water in a saucepan and add the potato,cook for a few minutes until just tender. Cook the chorizo: Heat a skillet over medium high heat and add the chorizo. Cook for 5-8 minutes until cooked through. Remove from the pan and place on a paper towel lined plate. Leave some of the oil in the pan. Cook the onion and pepper: Heat the oil from the chorizo in the pan over medium heat and add the onion and pepper. Cook until beginning to brown and becoming tender, 5 minutes or so. Stir in the potato and chorizo and cook for 3-4 minutes, add in the green chiles if using, and then remove from the heat. Cook the eggs: Whisk the eggs, 1 tsp. salt, and several grinds of black pepper in a medium bowl. Melt the butter in a skillet over low heat and cook until the foam subsides. Add the eggs and cook without stirring until they begin to set on the bottom, about 20 seconds. Draw a wooden spoon across the pan a few times to form large curds. Continue to cook, stirring occasionally, until the eggs are barely set and still quite moist, 1 to 2 minutes—do not cook through. Gently add the eggs to the chorizo mixture and then gently stir in 1 cup of the sauce. Assemble the enchiladas: Heat the tortillas in between two slightly damp paper towels (or in a tortilla warmer) so that they are flexible. Spray a 9×13 pan with cooking spray. Fill each tortilla with 1/3 cup of the egg mixture, roll and arrange seam side down in the pan. Cover and refrigerate overnight. Refrigerate the sauce as well. 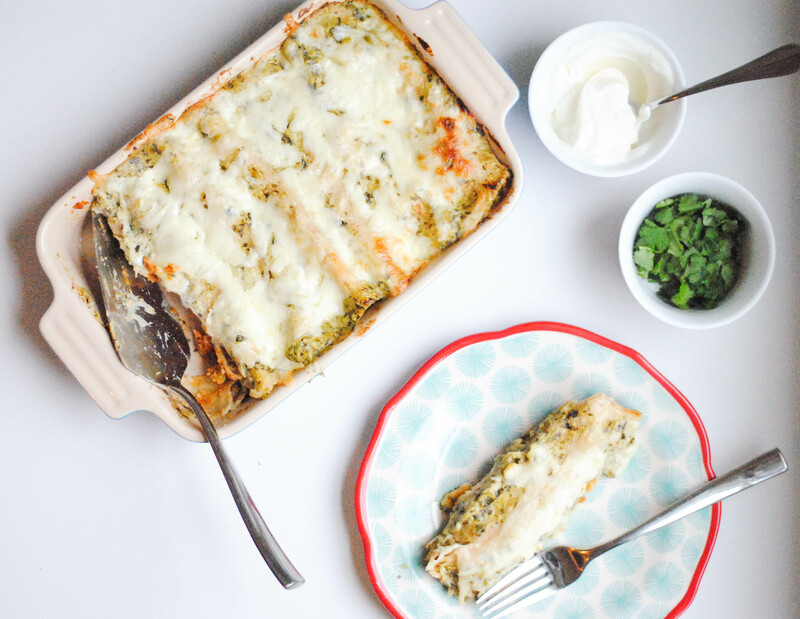 Bake the enchiladas: In the morning preheat the oven to 350°F. 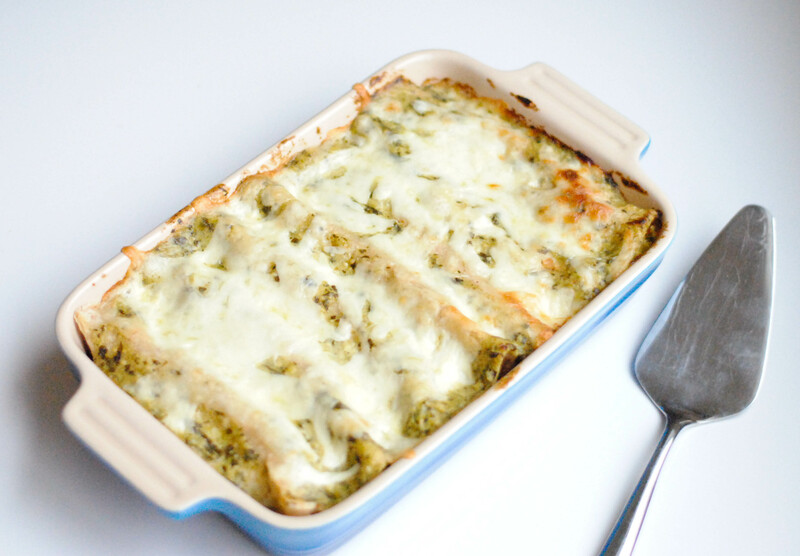 Pour the sauce onto the enchiladas, sprinkle with cheese and bake for 30-40 minutes until lightly browned. 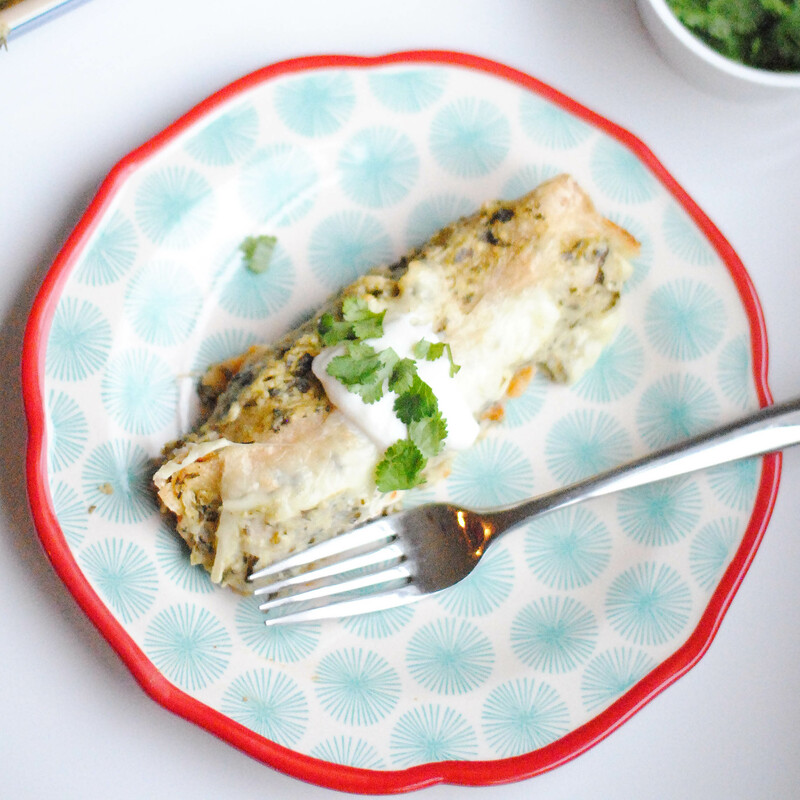 Serve with sour cream and extra cilantro. Confession time: I ate all but two of these. Myself. In a week. One night I ate 3 in one sitting. These are evil. And oh so delicious. I would like to make these again, and not simply with the intention of devouring them. This was my first time using these tins and I don’t yet know the best way to prep them or to remove the final product. 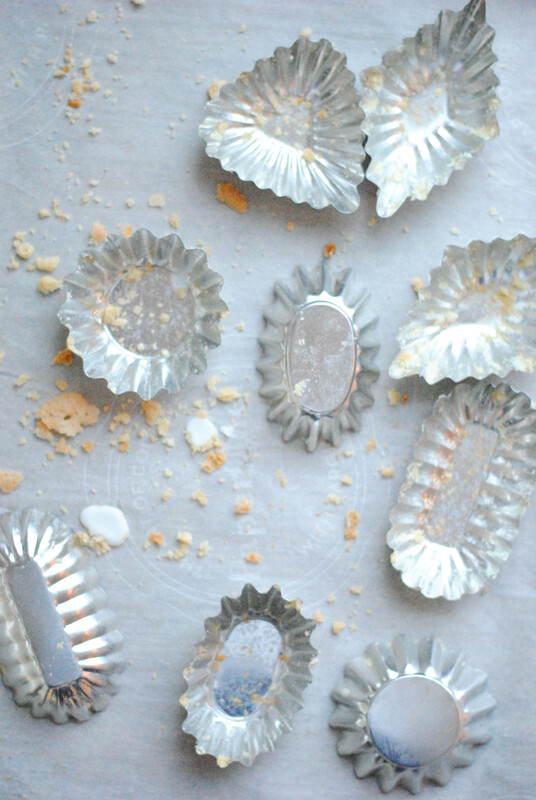 In the Fika book they are perfect rounds, which is darling and seems easier to remove than a fluted tin. I didn’t start out greasing them, but after I’d done a few I thought I’d better do it so that if the ungreased tins did stick I wouldn’t have ruined them all. I think greasing helped, but it was still tricky to get them out fully intact. That could also have something to do with the delicate-ness of the crust itself, though. The filling was more than I needed for the dozen tart shells I prepared. I think that the crust was a bit thick on some of them, so I could’ve probably stretched the dough for the crusts a bit and made at least 3 more than the dozen I made. The filling does cook up so don’t fill them too much or it will run up and over the crust. To finish these off, you can either give them a nice dusting of powdered sugar or a simple powdered sugar glaze. I love the look of both, but chose the glaze since it added another texture to the tart. This isn’t a dessert you make on a Wednesday just ’cause. Or maybe it is! 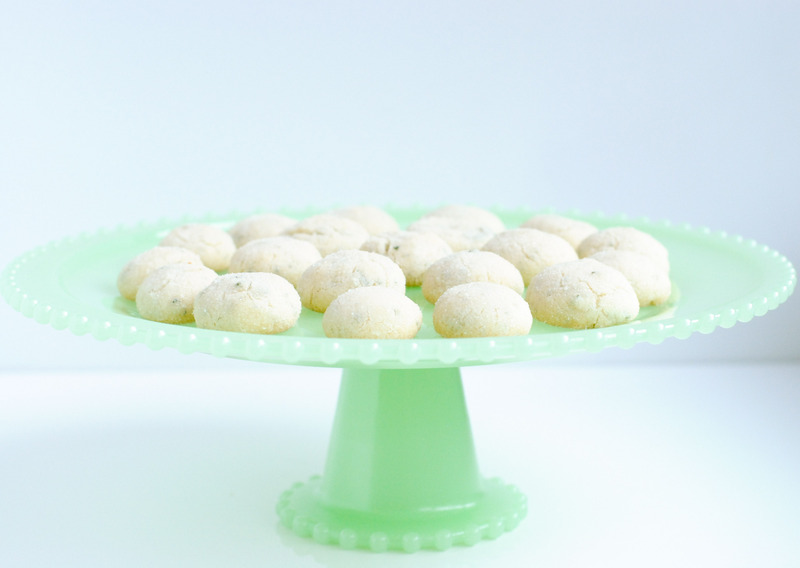 I think they’d be a great addition to a dessert spread and perfect for a little tea or coffee party. They keep very well in the fridge for a few days, just let them sit at room temp to warm up a bit. Enjoy! 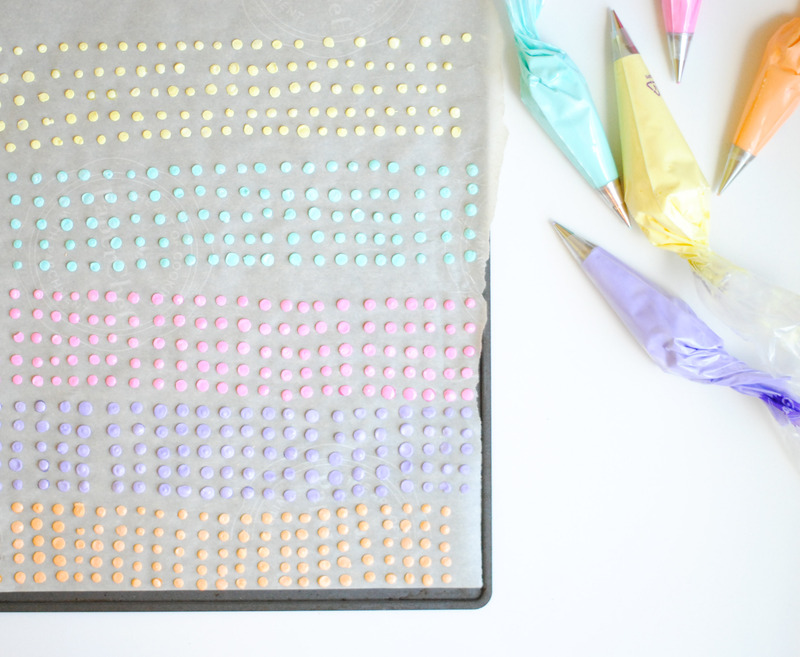 Hopefully this is all you will want to leave behind of these sweet tarts. Combine flour, sugar, salt and butter in a food processor and pulse until mixture looks like coarse sand. Add in the egg and mix until dough comes together. Wrap in plastic wrap and chill for at least an hour. Grease 12-16 tart tins. If you have small tins you will use more, bigger tins you’ll need fewer. Divide dough into as many pieces as you have tins. Press a piece of dough into the tin and up the sides making it as even as possible. Repeat for all the tins and place on a baking sheet. Fill the tarts about 2/3 full with the almond filling. Err on the side of less filling since it could spill over the edge of the tart. Bake for about 20 minutes, until tarts begin to turn golden. Cool tarts completely and remove from the tins before whisking together glaze ingredients and pouring a thin layer over the filling of the tart. 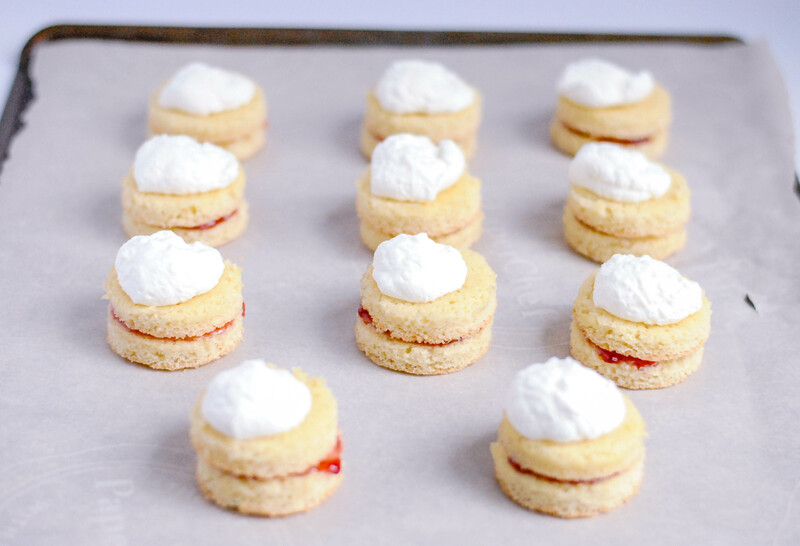 You can also dust them with powdered sugar or leave them plain. With any cookbook you are going to encounter some duds and some stand outs. I’ve made a couple of duds from Fika that I don’t see myself ever making again. But then there are the stand outs, and there are two types of stand out recipes. Some are delicious but take so much work that you’re unlikely to repeat them. Other stand outs are delicious and not overly complicated which makes them much easier and enjoyable to make again. This radio cake didn’t seem like it would fall into either stand out category, really. It just seemed safe. It looked easy (a big plus for me!) and like it would be ok in the flavor department. Turns out this is a true stand out that I can easily see myself repeating since it is simple to prepare, delicious, and lovely to look at. It’s also unique, something I’d never made or eaten before. You can keep this simple or dress it up. 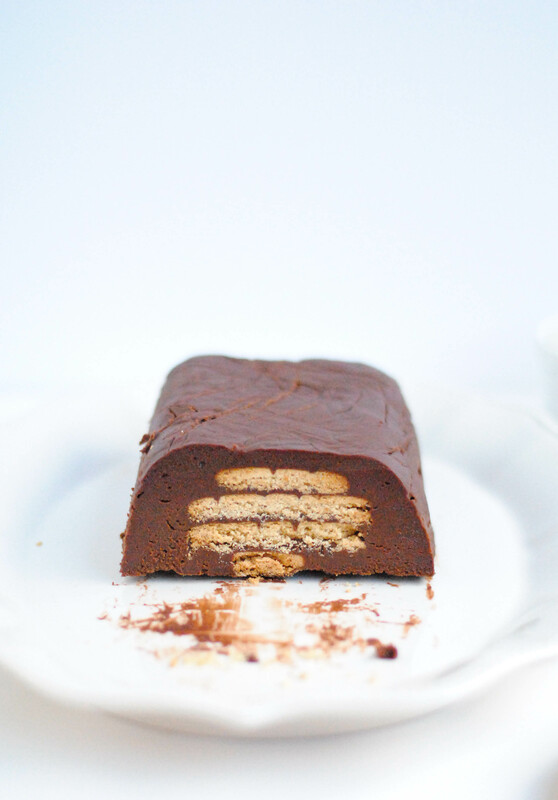 A plain slice of this would be fine to enjoy as an afternoon treat by yourself. 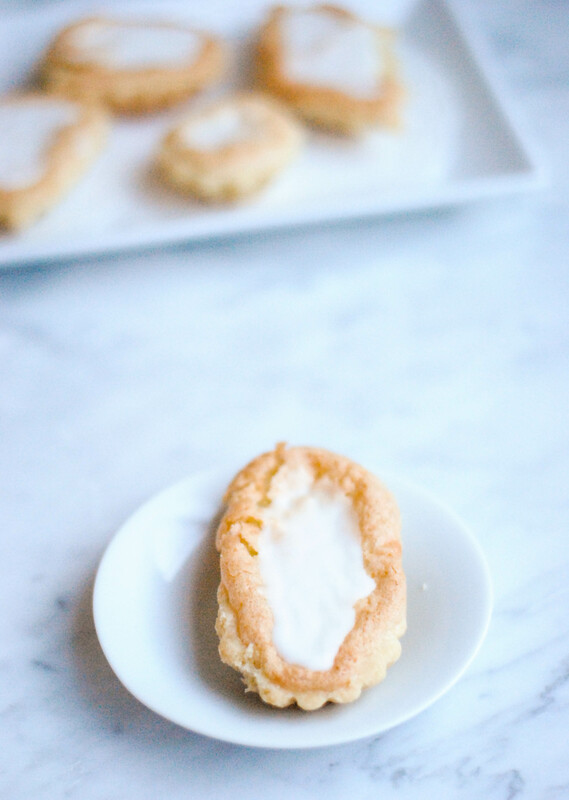 Or you can add some whipped cream and cookie crumbs and serve it to your dinner guests. Speaking of dinner guests, you can make this hours before if not a full day before you need to serve it, making it an even better choice to serve guests for dessert. This is pretty rich and can be changed based on the type and quality of chocolate you use. I used Ghiradelli bars, one 60% and one 70% cacao. It was rich, a thin slice was plenty for me. 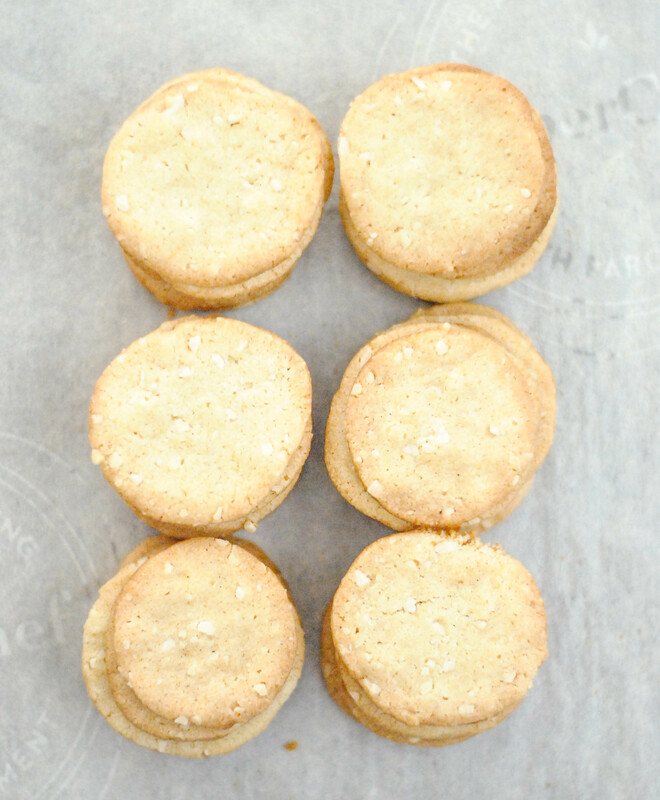 The recipe calls for Marie butter cookies. 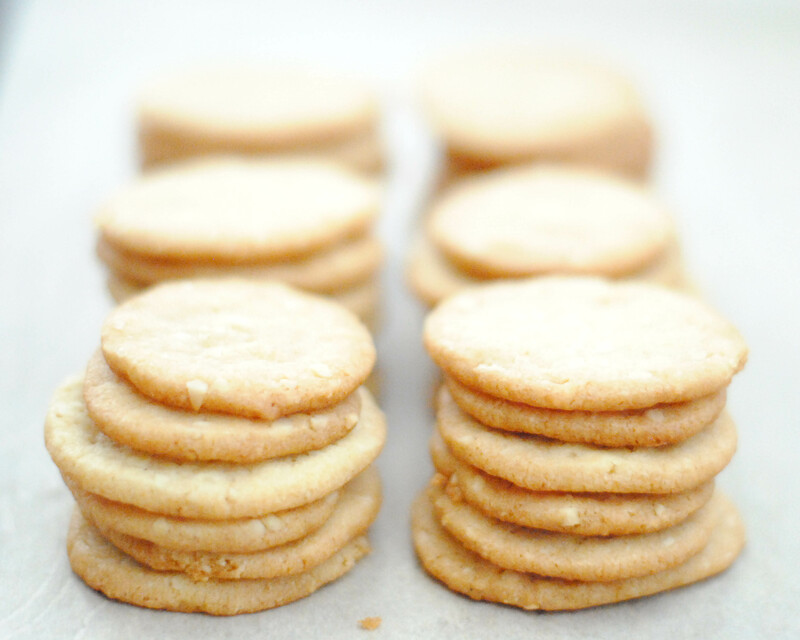 I couldn’t find those, so I used a digestive biscuit cookie that I hadn’t tried before. I finished the package I bought for the cookies and went back and bought two more just for snacking. 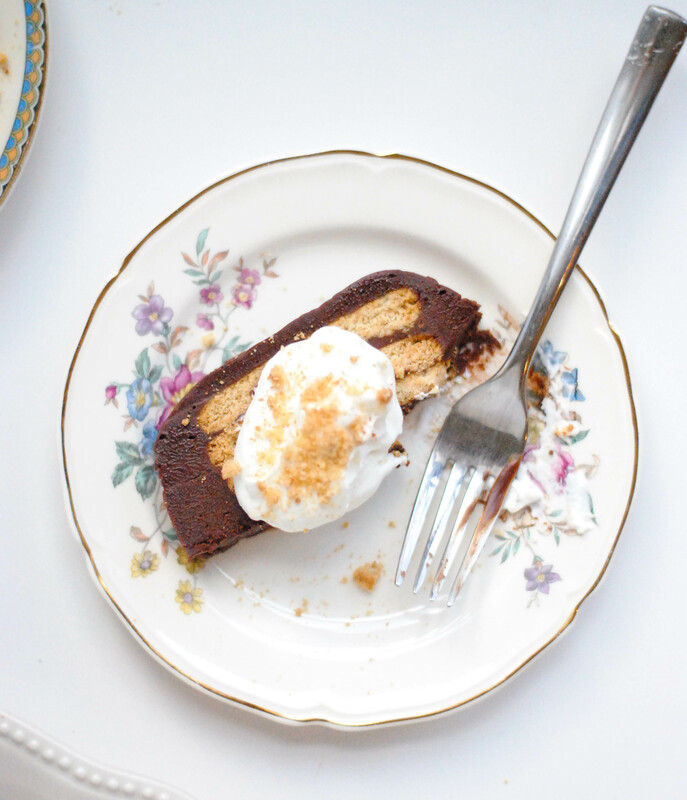 It has an almost graham cracker-like taste with a hearty texture that pairs well with the chocolate and cream (if you’re wise enough to add a dollop). These cookies were too big to fit three in a row in my loaf pan on the bottom layer, so I broke them in half to fit. As you can see in these photos, I didn’t do a great job of putting the plastic wrap in the loaf pan. There are all kinds of creases in the chocolate. In my defense, plastic wrap is a pain to keep smooth so I was lucky to get it in there at all! I placed one sheet horizontally and a second vertically. I guess there’s a way to smooth the top after you’ve inverted it on to a platter, but I’m not sure what that is. I’d probably make it look worse if I tried to make it better, though, so leaving it alone was a better choice for me! To slice this I thought at first of using a large chef’s knife, but then thought that a bench scraper would be a better choice to make one nice clean cut. I warmed it underneath hot water, dried it, then cut straight down on the cake for a nice clean slice. Not a beautiful serving tool, but a functional one. Now. Those eggs. I’m not sure if they’re warmed enough by the addition of the melted butter/chocolate mixture. To be safe they need to be warmed to 160°F. I did not check that they were. Bad. I know. Grab a thermometer and check them after mixing. If it’s not warmed enough you could set it over simmering water and whisk away until it does. I escaped without any issues, but will check next time for sure. I loved that the wonderfulness of this “cake” was such a surprise! 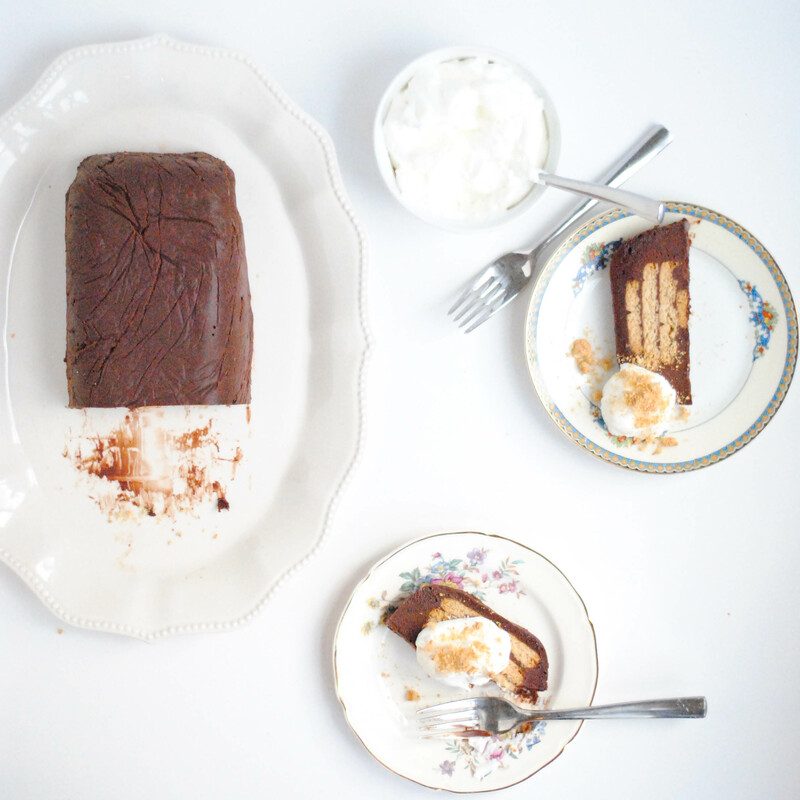 I just thought I was checking off another Fika recipe, and it wound up being terrific. Looking forward to seeing what the next recipe holds. Here’s hoping it’s another pleasant surprise! Melt the butter and chocolate together in a bowl either in a double boiler or in the microwave in 30-45 second increments stirring in between until melted and smooth. In another bowl beat eggs, powdered sugar, cocoa powder and vanilla until light. Add in the melted chocolate mixture and beat to fully combine. Spread a layer of chocolate in the pan, then lay cookies down in a row on top. 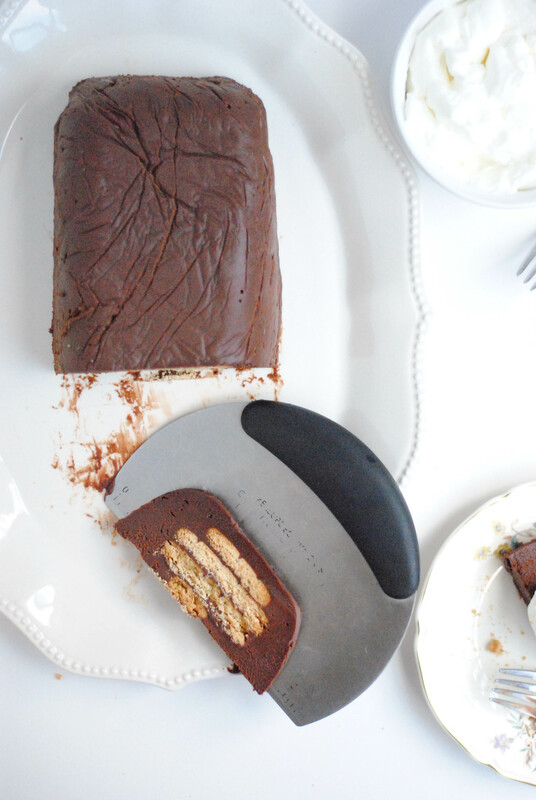 Cover with chocolate, then cookie, repeat until you have 3-4 cookie layers and end with chocolate. Invert on to a platter and peel off the plastic wrap. Slice and serve with whipped cream if desired. One of the great things about cooking and baking is that there is never a point at which you know it all. There are flavors and foods you haven’t tried or methods that are new to you. 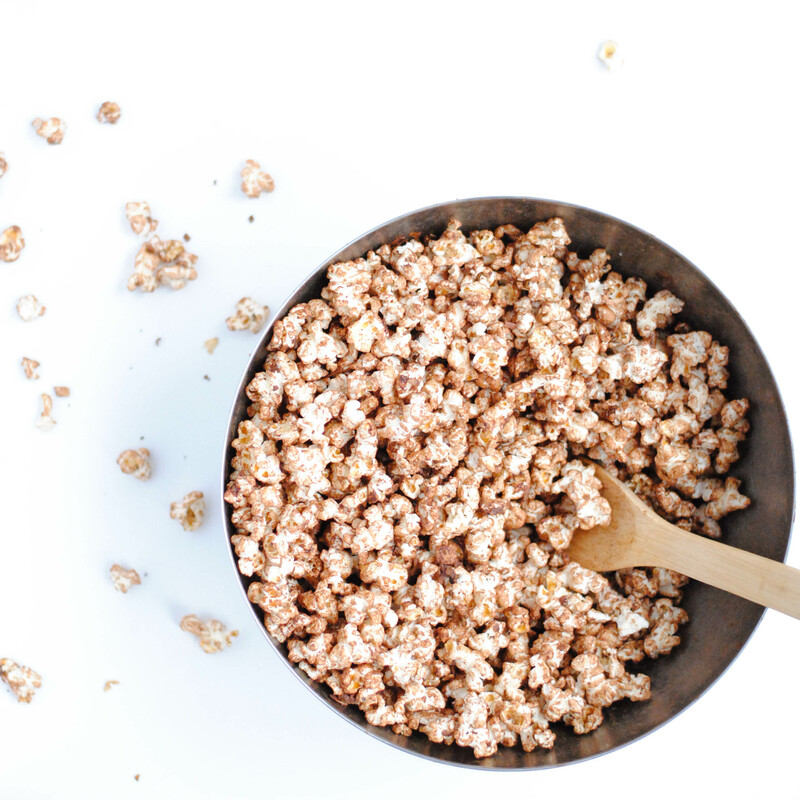 With this recipe I learned how so very easy it is to pop your own popcorn on the stove-top! For some reason the thought of popping it on the stove has always seemed like it would take too much time and effort. But it’s actually very simple and fun, too! My kids thought it was amazing. You also get the added benefit of being able to control fat and salt. When I pop popcorn in the microwave I either burn it or have a bunch of un-popped kernels. With this method it was just about perfect, very few un-popped and no burnt pieces. This is a Fine Cooking recipe from the Dec/Jan issue. 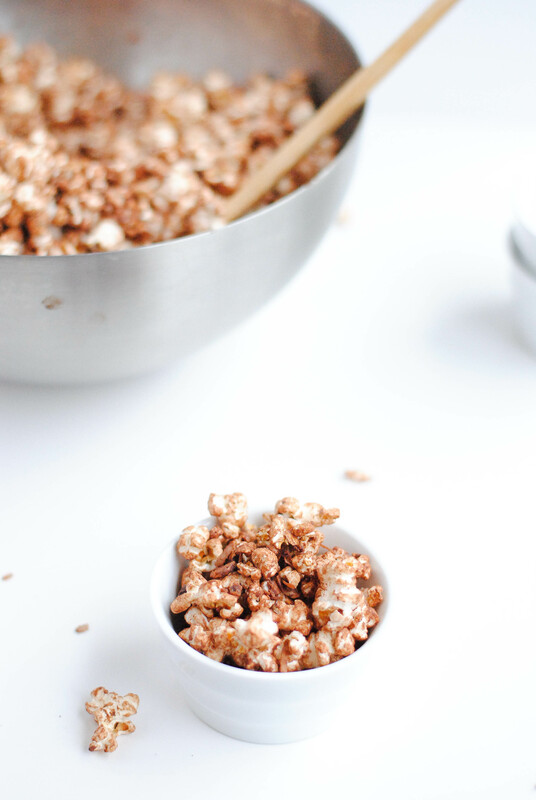 They give you the basic popping method, and then there are 7 popcorn recipes from cinnamon toast (can’t wait to try!) to pepperoni pizza. I chose this chocolate and coconut one and added some sliced almonds. This is best eaten the same day as it’s made, but it still ok the next day. Not sure beyond that. Like a salad with lots of stuff in it, the good stuff tends to sink to the bottom of the bowl, so be sure to scoop from the bottom. 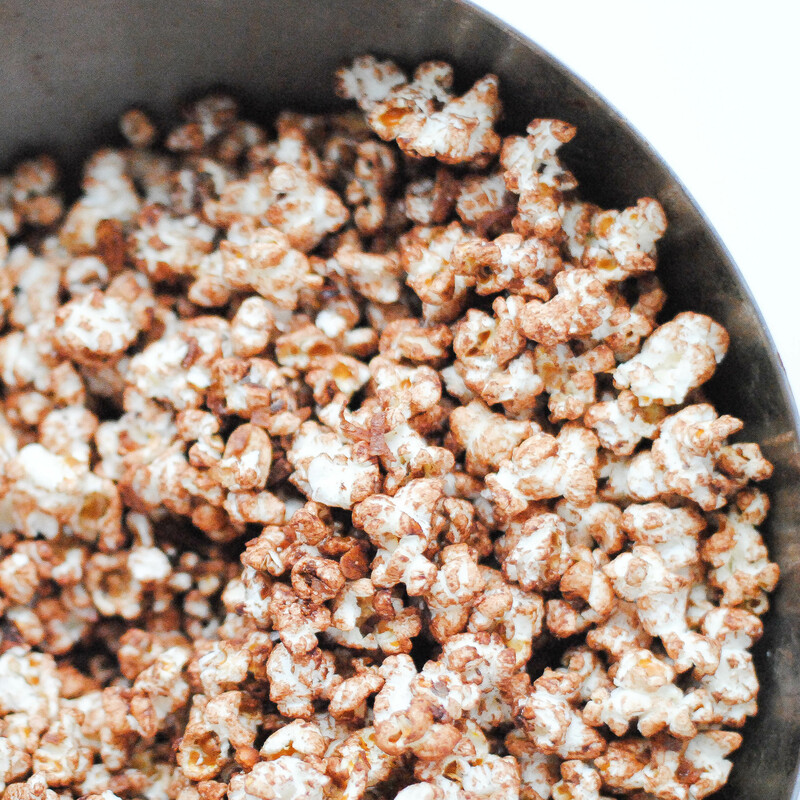 Put the oil and 2 or 3 popcorn kernels in a heavy-duty 4-1/2- to 5-1/2-quart pot. Partially cover and heat over medium-high heat until the kernels pop. Add the rest of the popcorn kernels. Cover the pot most of the way and shake the pot back and forth constantly once the heavy popping starts. It helps to have two pot holders or heavy kitchen towels at this point. After about 3 minutes, the popping should slow down; when you can count to 5 without a pop, it’s done. Remove from the heat, and give the pot a final shake. Transfer to a large bowl and season as you like. Toast the coconut by spreading it out onto a rimmed baking sheet and baking in a 300°F oven for 8-10 minutes, stirring occasionally. Toast until golden brown and fragrant. Set aside. Pop popcorn according to the recipe above. 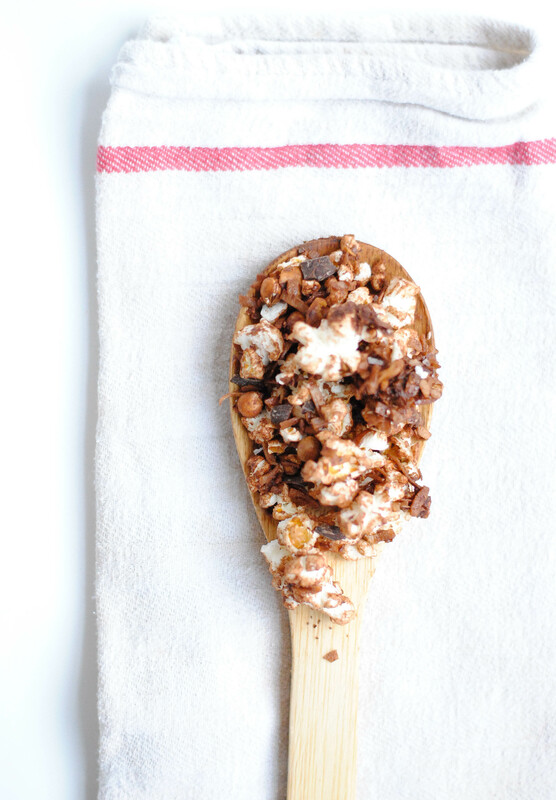 Immediately after popping pour into an over-sized bowl and toss with the chocolate, coconut, almonds and 1/2 teaspoon salt. Once it’s evenly coated refrigerate for 5 minutes, then gently toss again breaking up any large chunks. Season with more salt if desired.